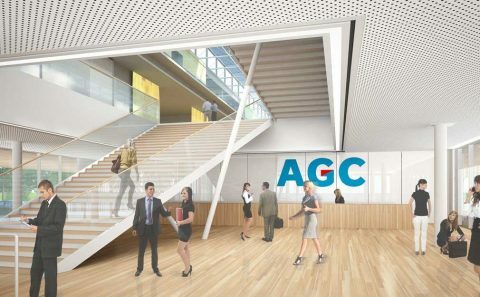 Pedestrian and automobile pathways enter from opposite ends of the grounds but come together again south of the building where the glazed entrance hall welcomes AGC staff and visitors. 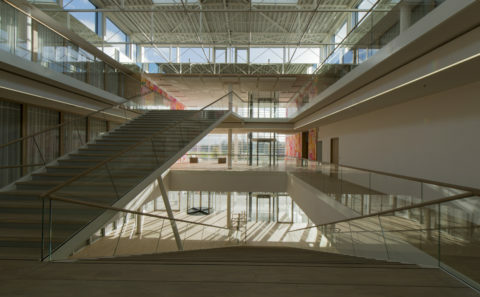 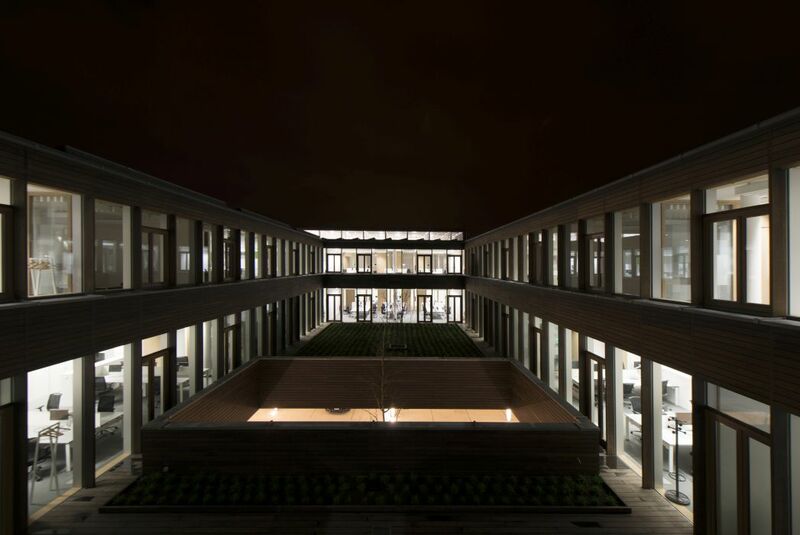 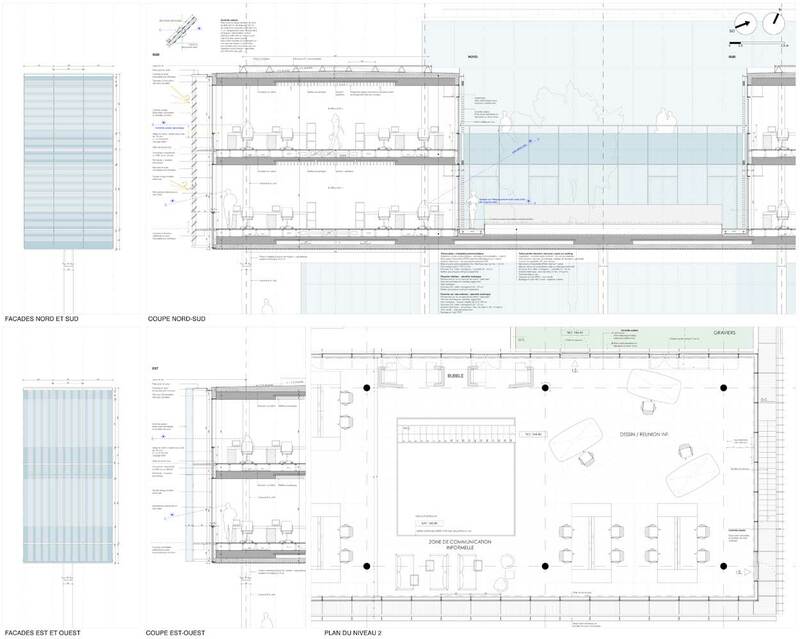 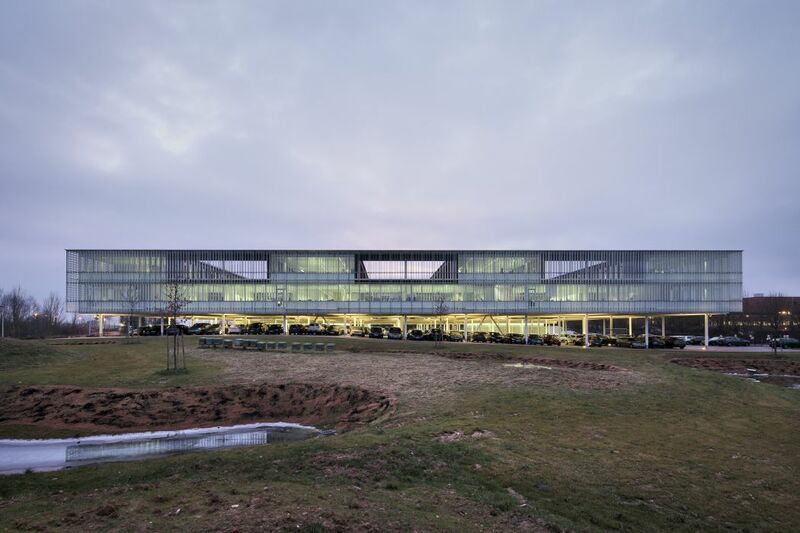 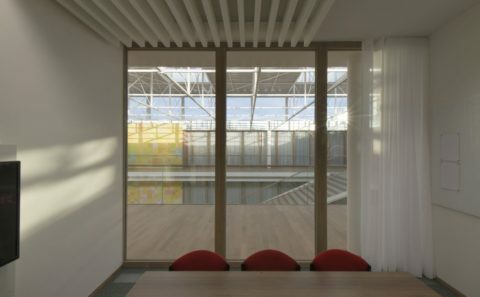 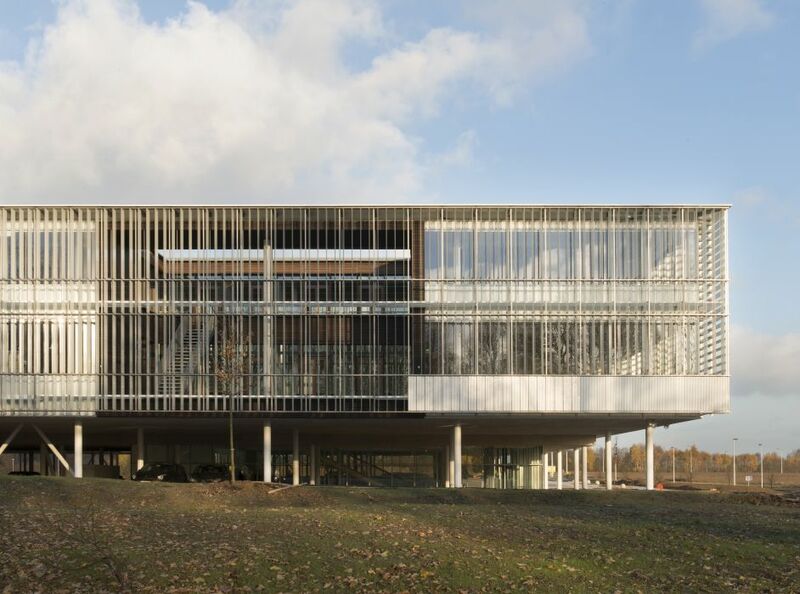 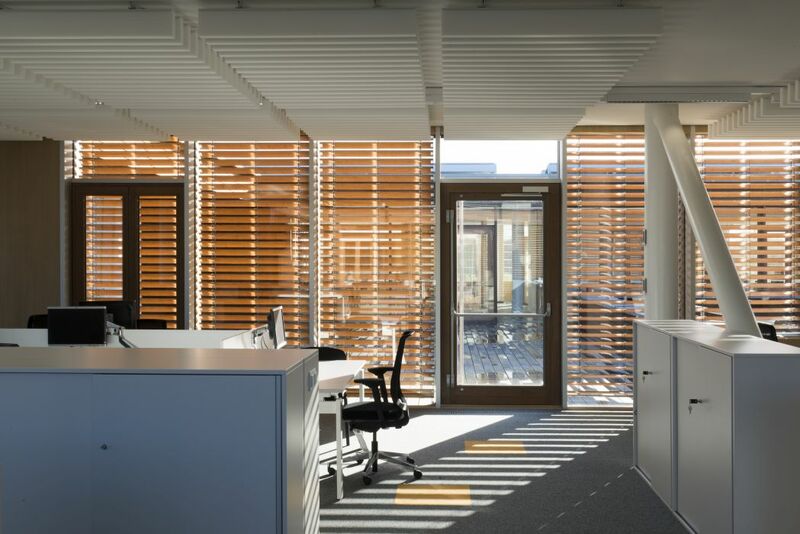 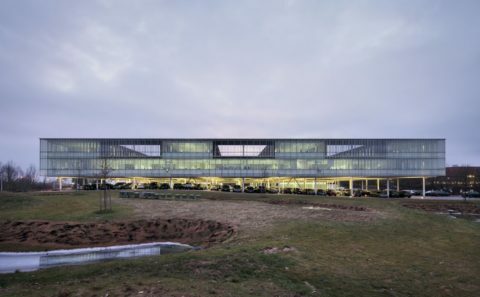 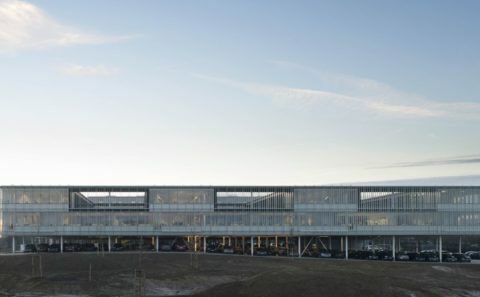 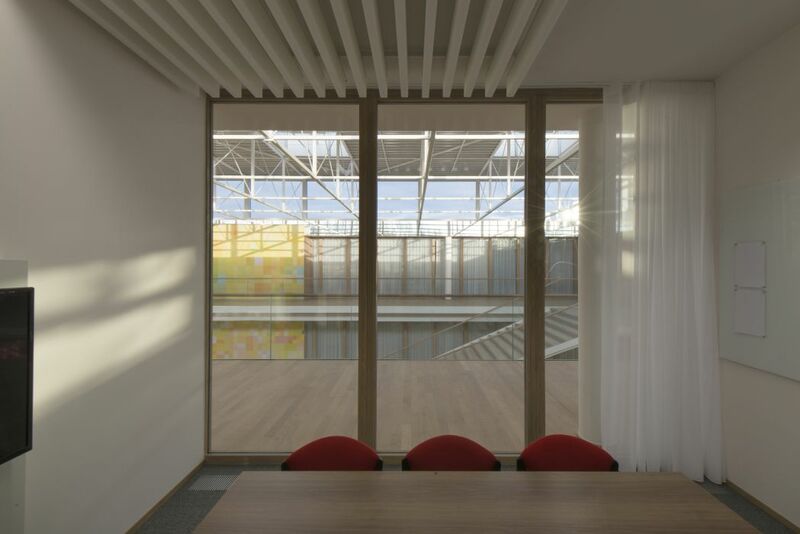 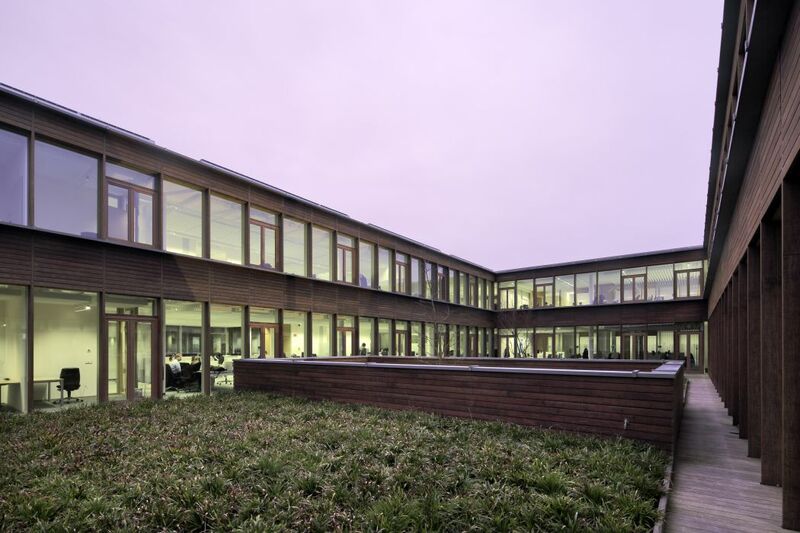 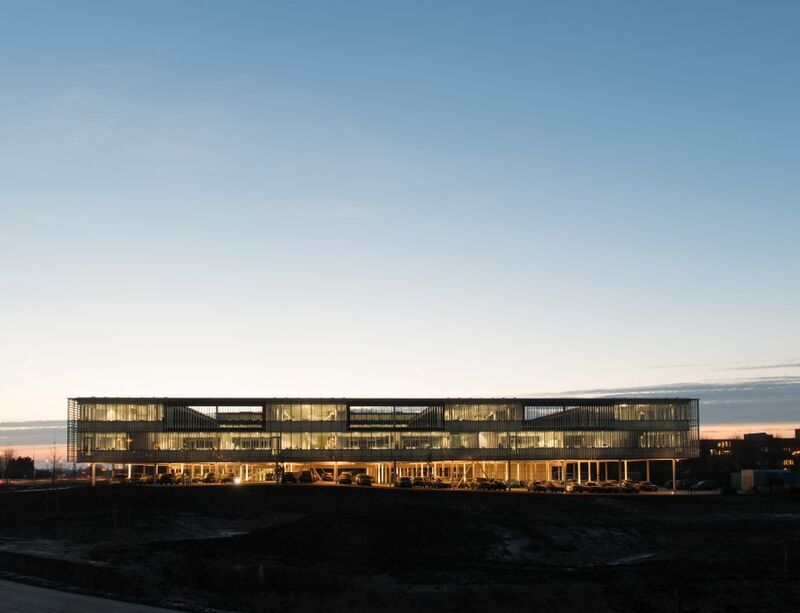 The internal office layout, which is evenly plotted onto a square plan with sides of 81 m, is determined by the natural light and the quality of the views. 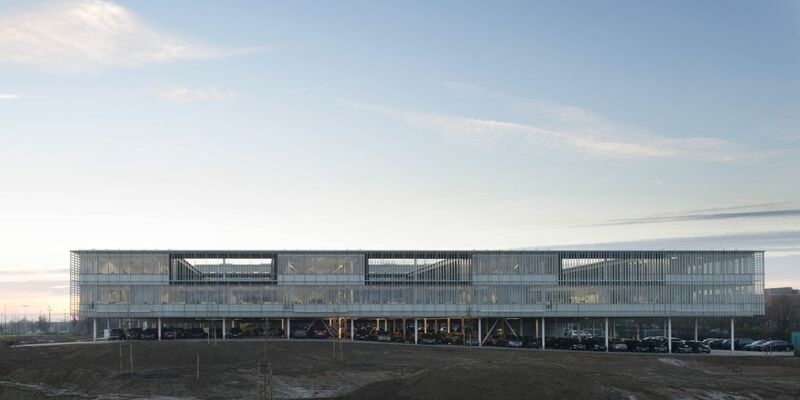 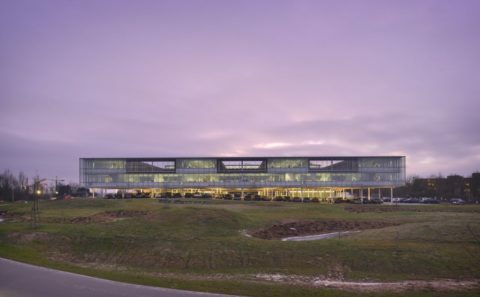 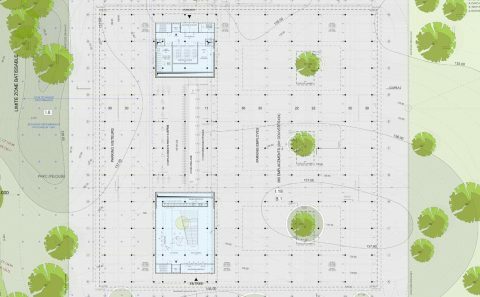 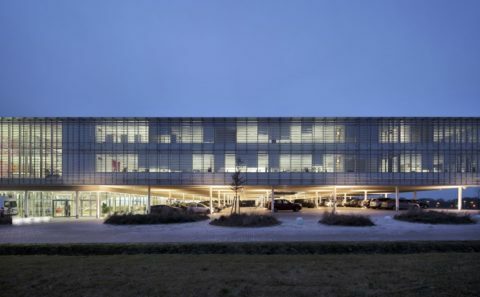 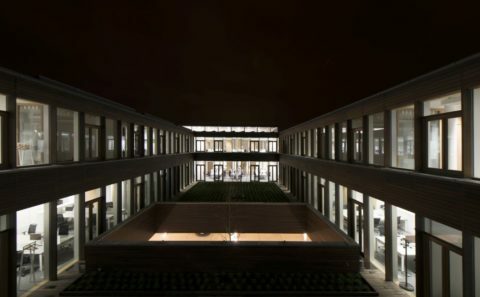 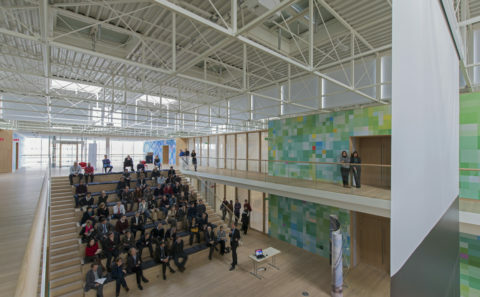 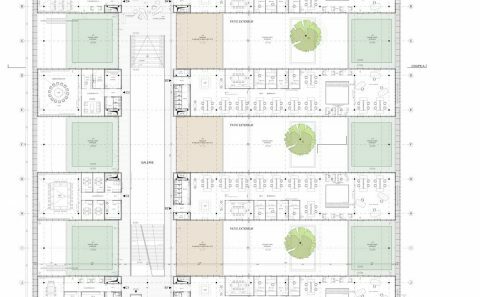 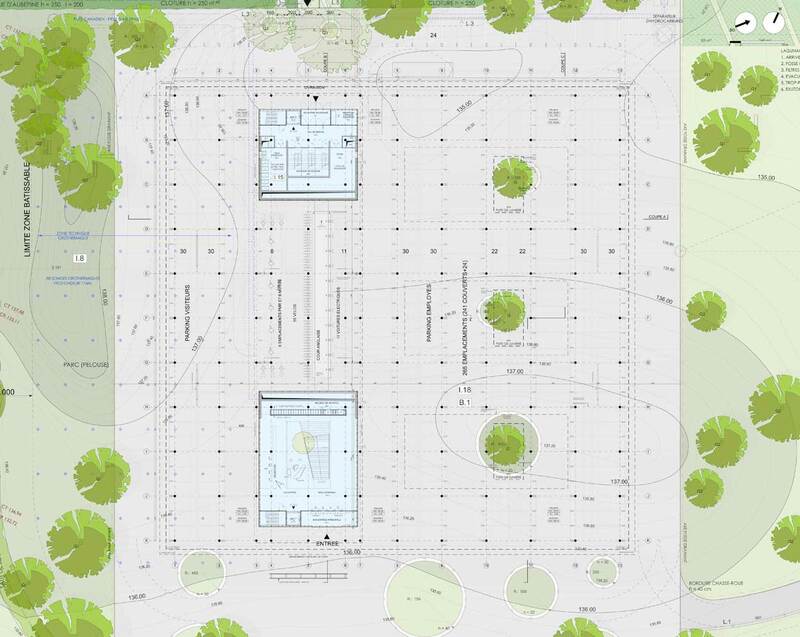 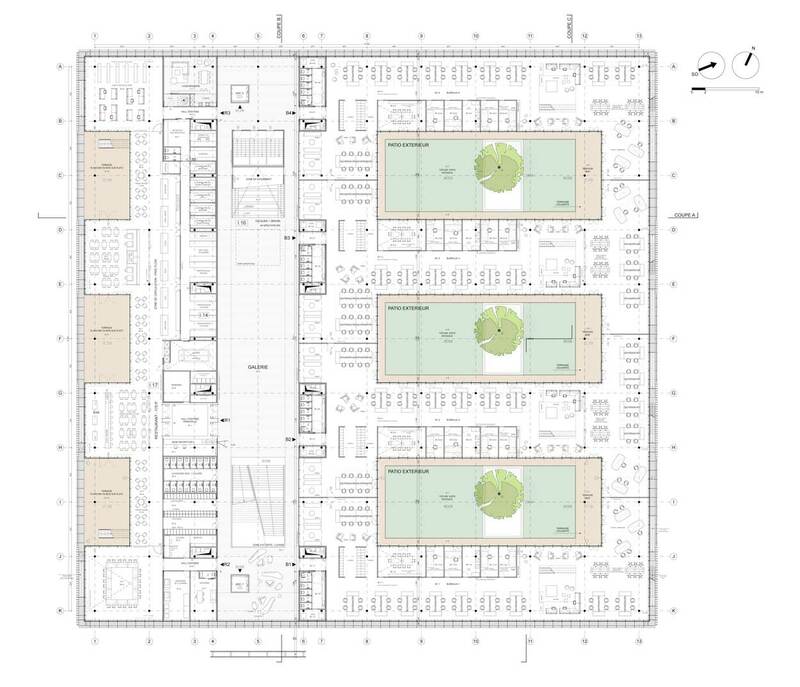 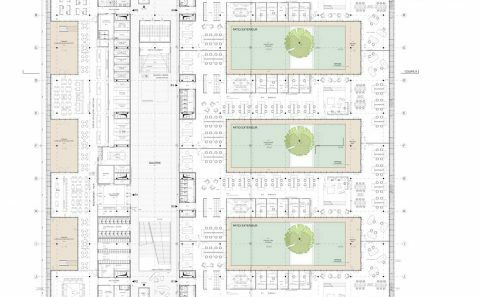 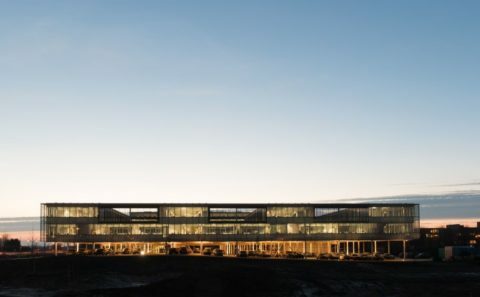 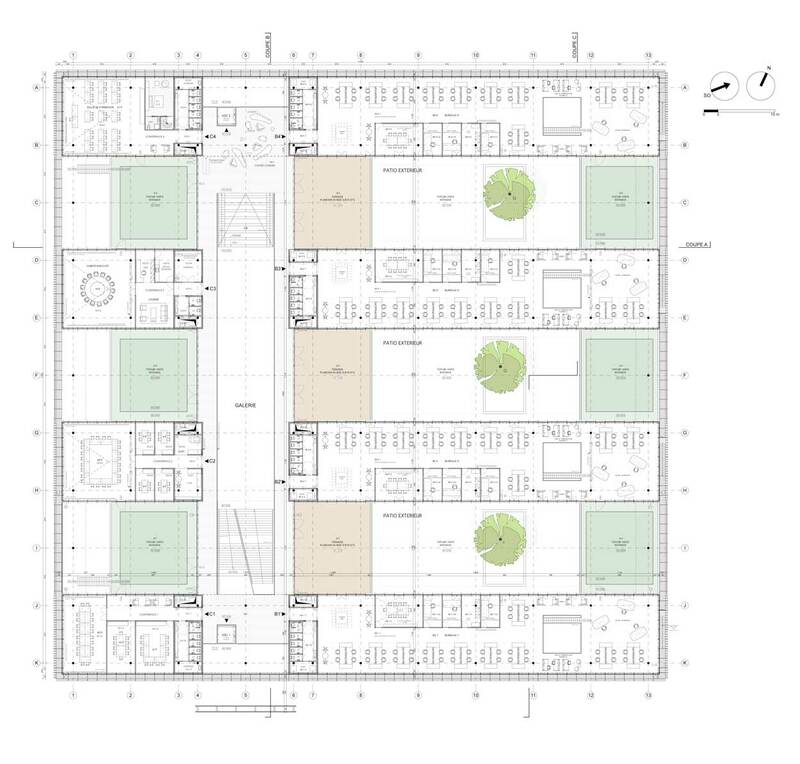 The duality between compactness (energy performances) and layout (visual comfort and well-being in the workplace) has resulted in the division of the plan into four wings, arranged around large exterior patios enlivened by the elements. 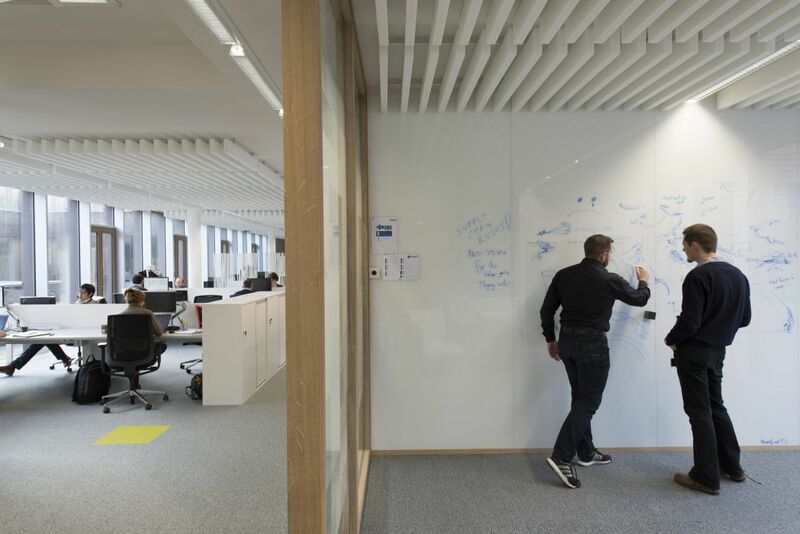 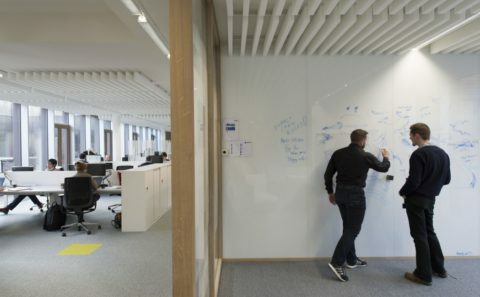 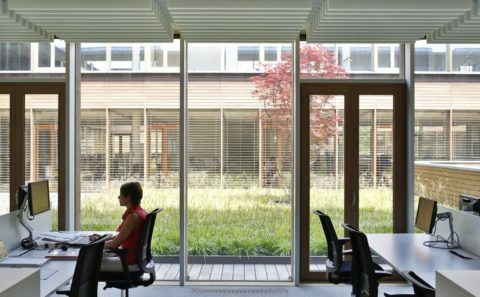 84 % of workstations are positioned less than 4 m from the walls; 95 % enjoy an unobstructed outside view and 100 % of meeting rooms have both these features. 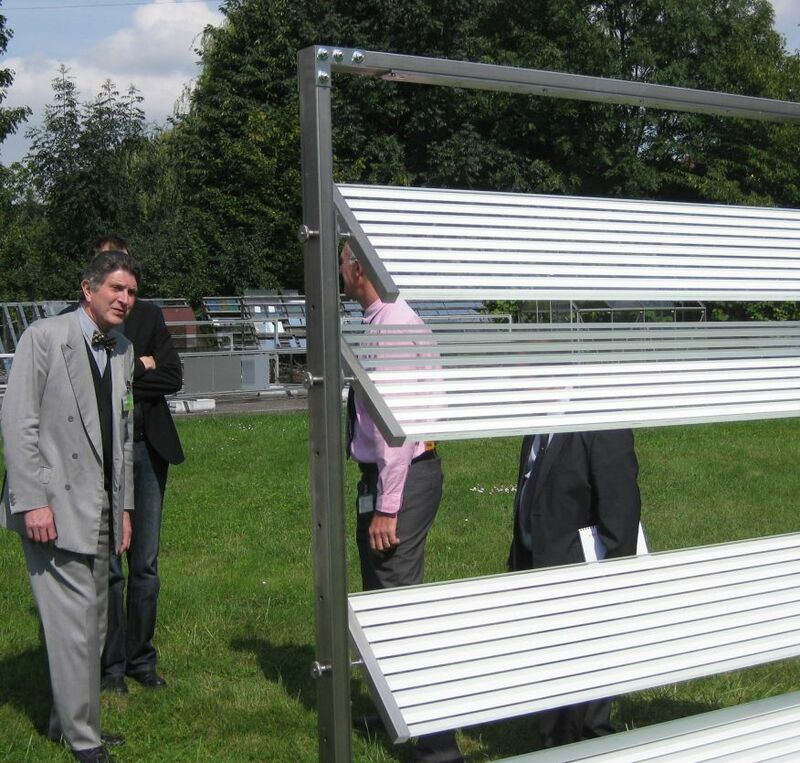 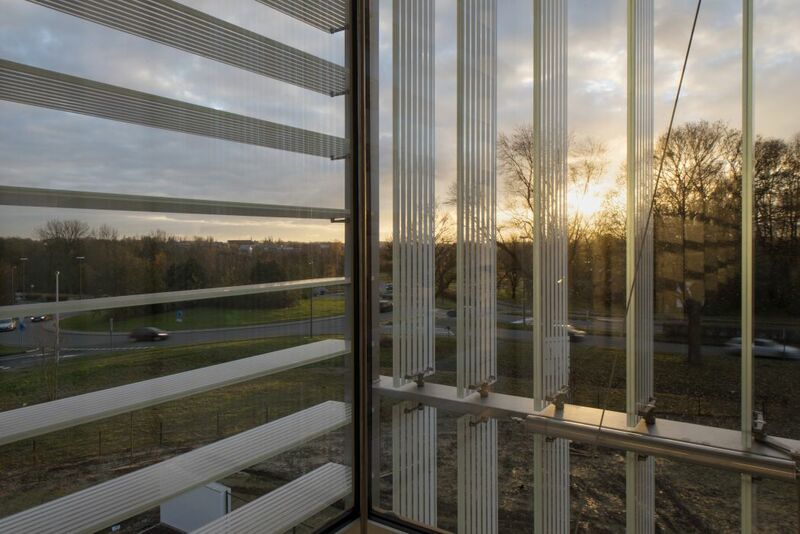 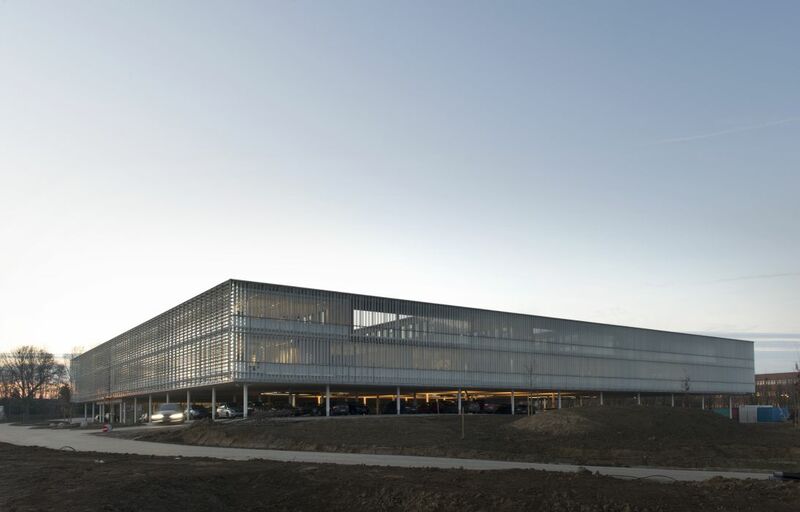 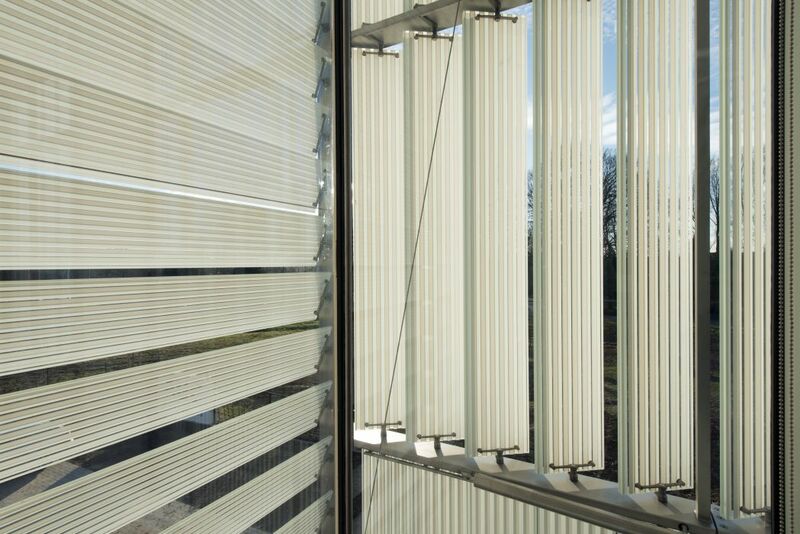 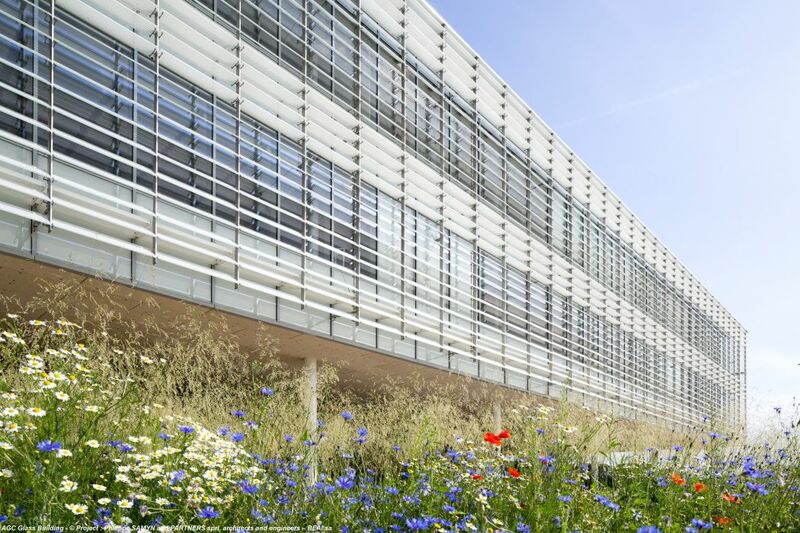 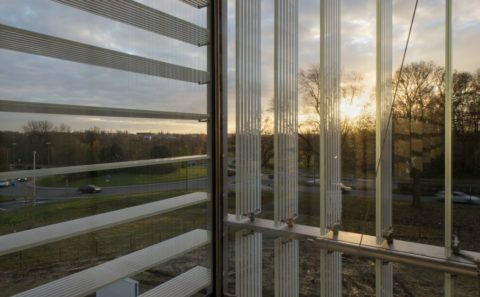 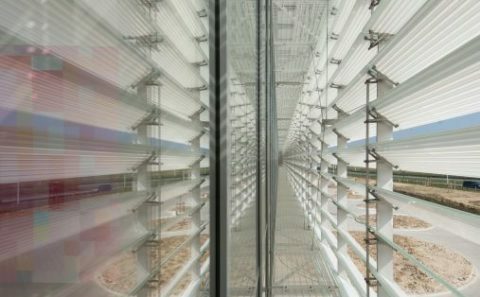 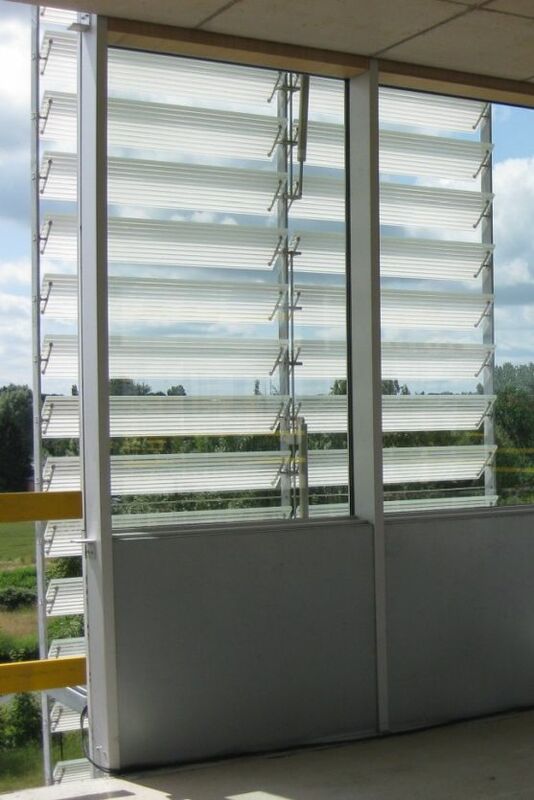 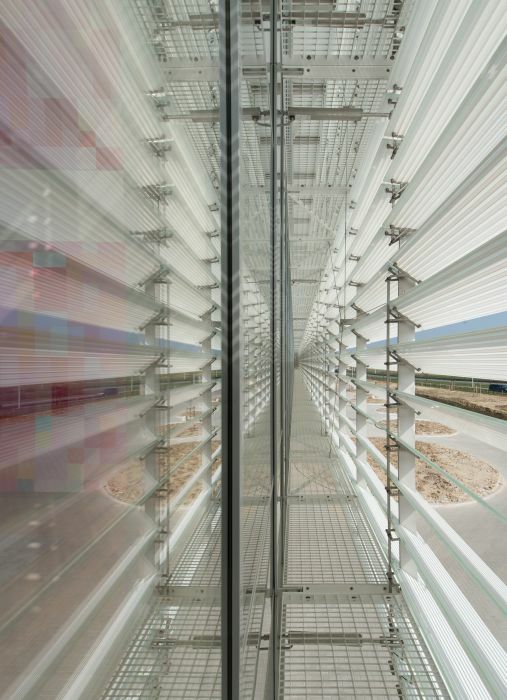 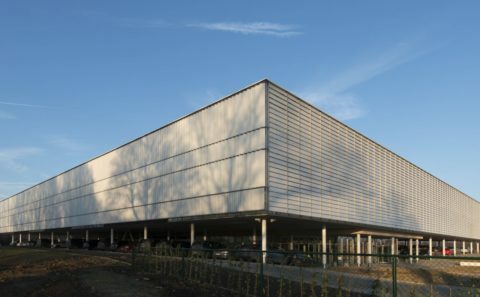 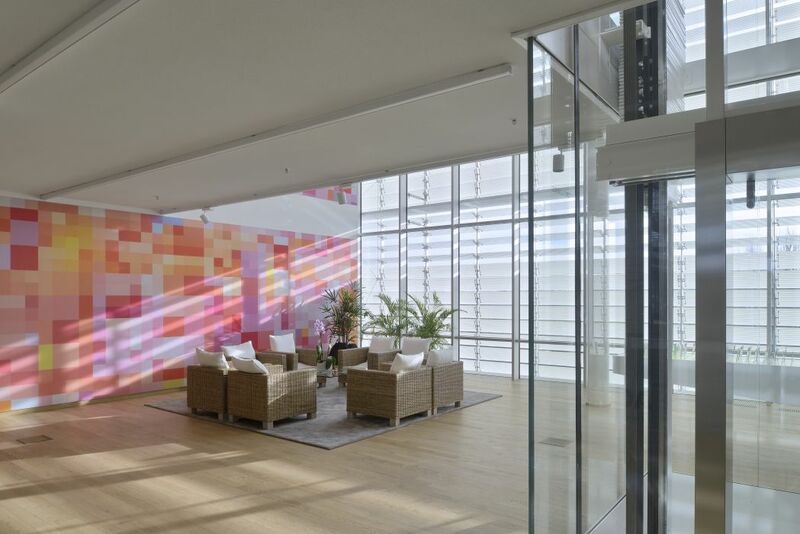 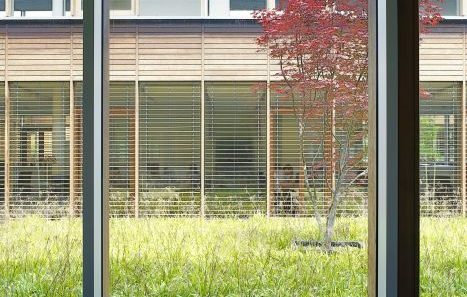 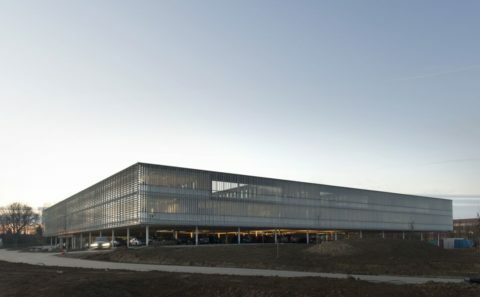 Peripheral glass facades are equipped with glass sun shades which automatically turn towards the sun. 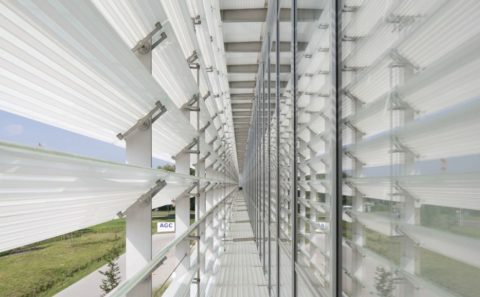 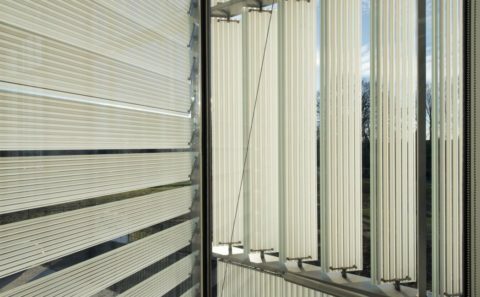 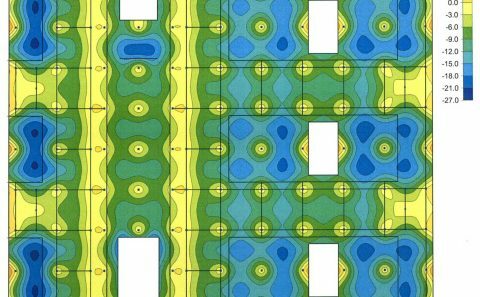 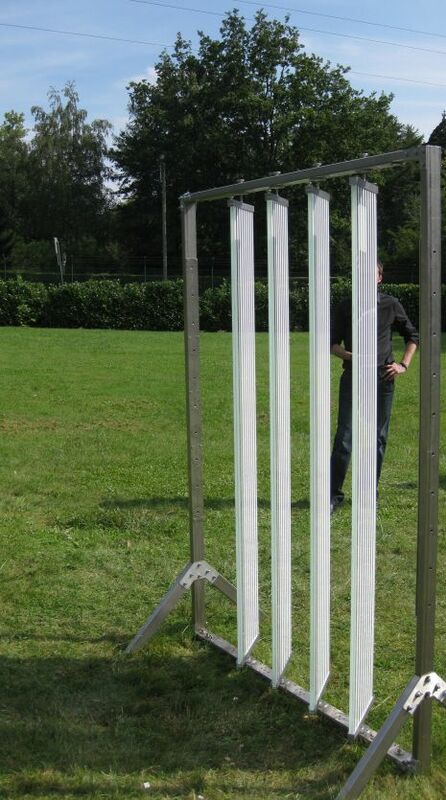 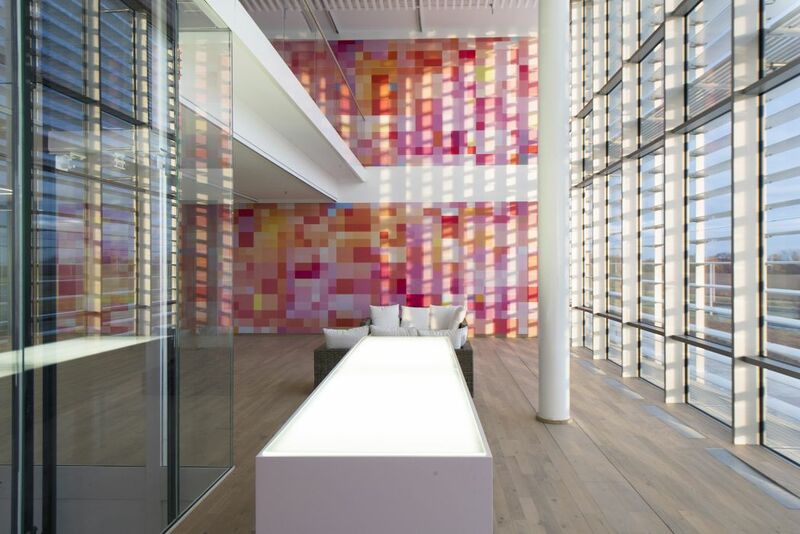 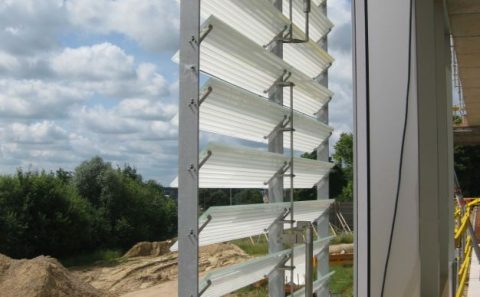 The light filtration provided by these slides is possible because the surfaces have been treated and printed with alternate bands of white, allowing the passage of diffused natural light. 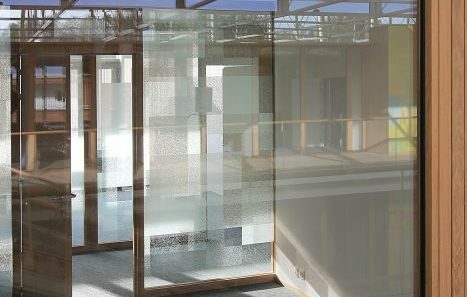 Mobile glass blinds have been fitted to the outside of all the other windows. 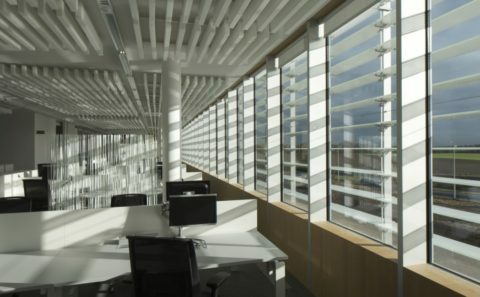 All the windows have horizontal light reflectors, high up, which send a significant amount of light in the depth of the office floors. 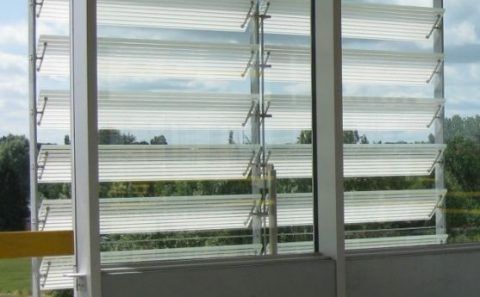 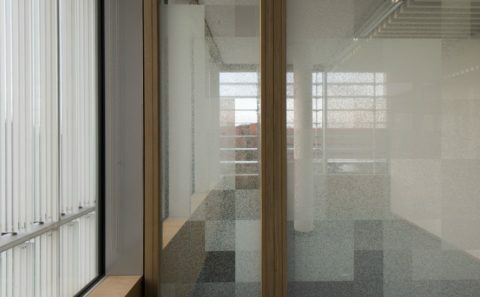 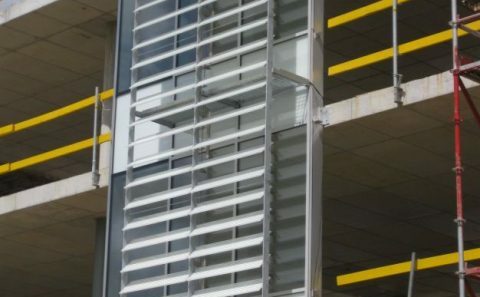 Coated opaque spandrel glass, which has been well-insulated, maximises heat reflection through glass panels etched (on the outside) and enamelled (on the inside). 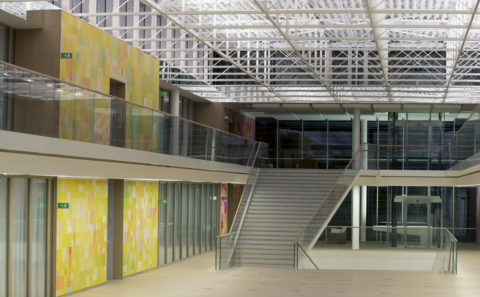 Crosswise to the office wings, a gallery (or atrium) provides an obligatory route for everyone in the building; all of the services in the building converge at this point. 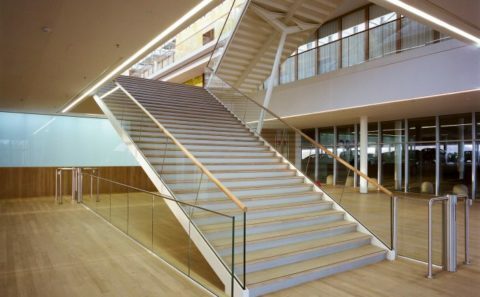 The generous size of the gallery – 10 m high, 13.5 m wide and 83.7 m long – makes it a ideal venue for various events: informal employee meetings, launch parties for the latest glass products, conferences at the foot of the great staircase (on tiered seats), external events etc. 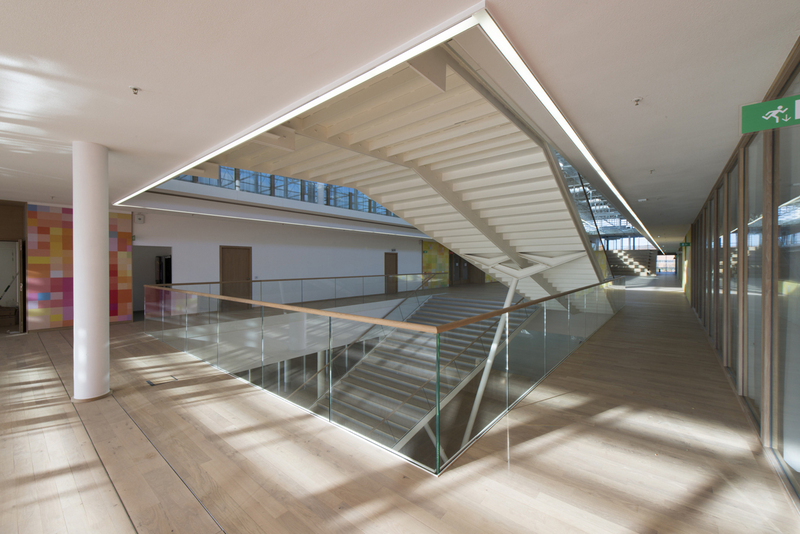 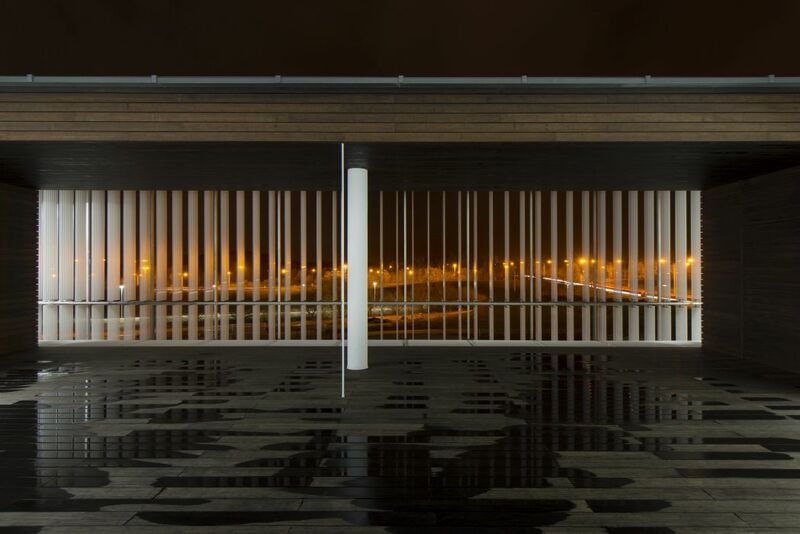 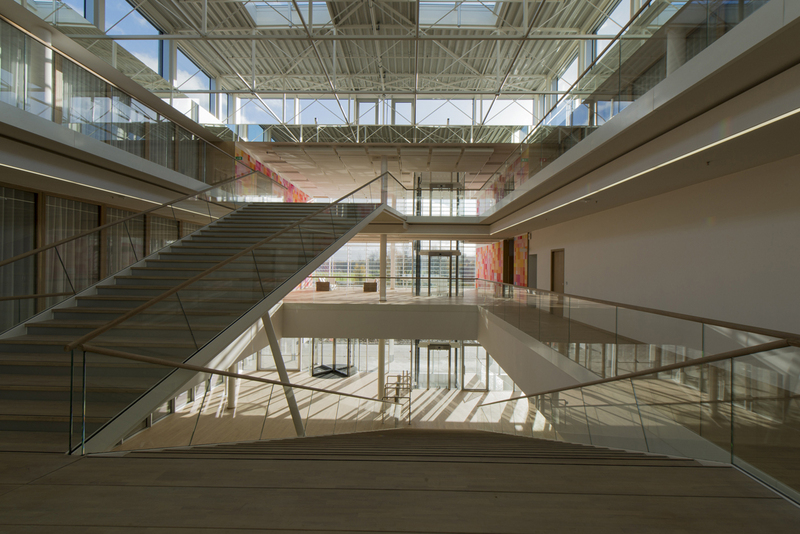 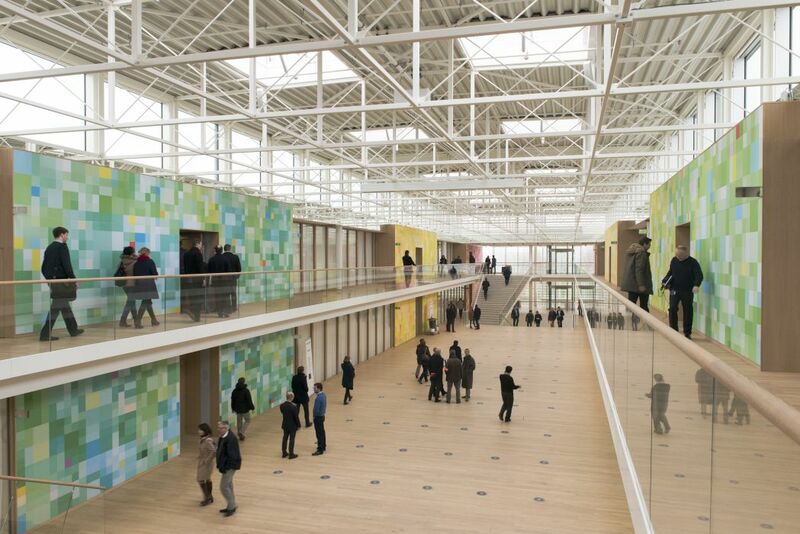 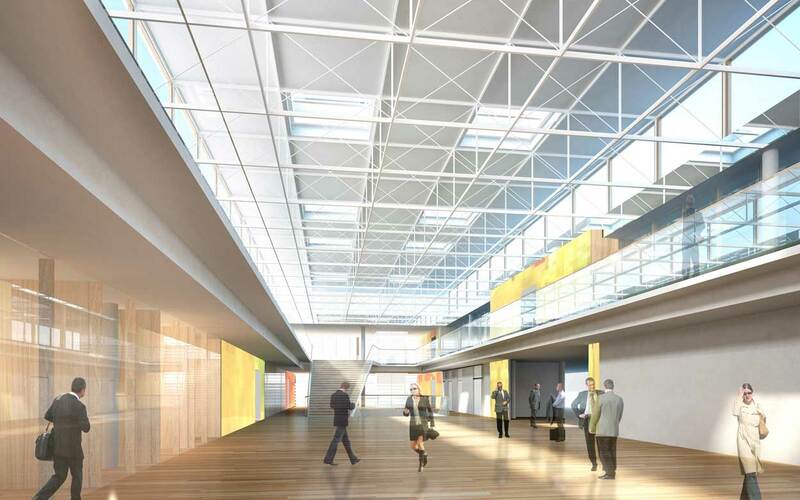 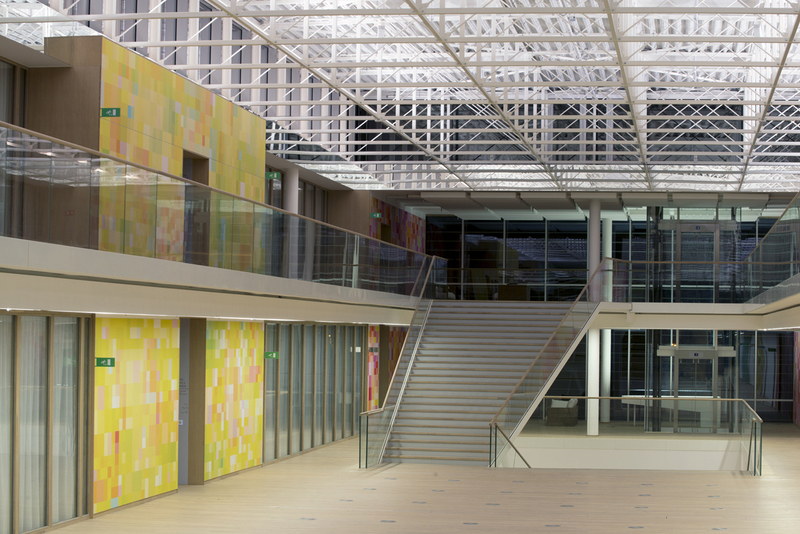 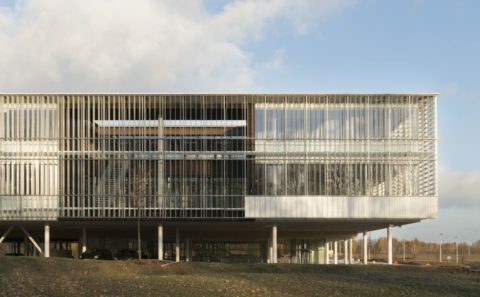 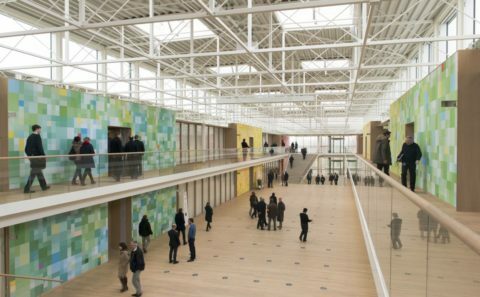 The gallery provides access to all the useful areas in the building: the reception desk and associated services, the restaurant with its terraces to the west, the conference centre and each of the eight office wings (to which access is controlled). 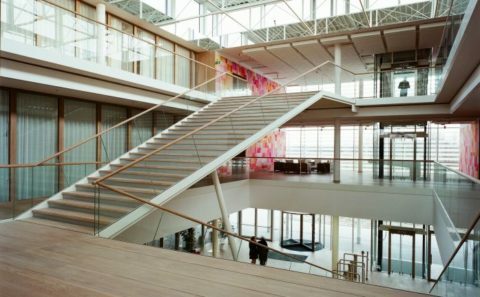 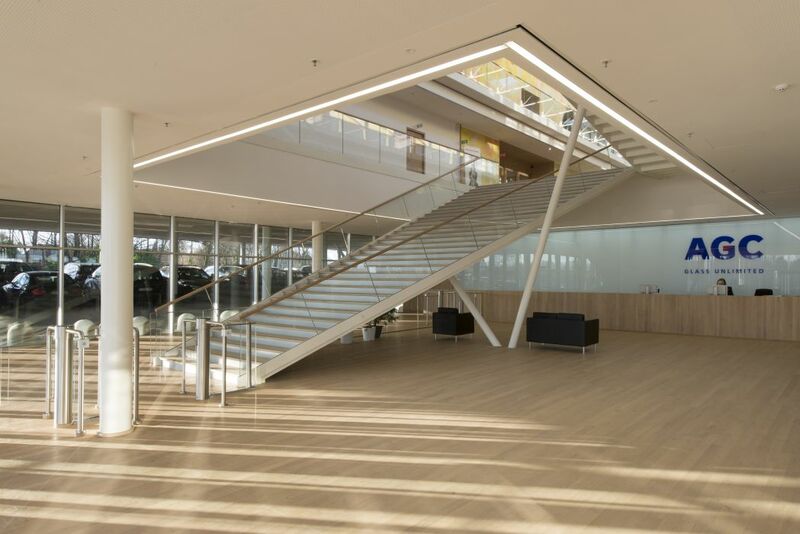 In line with the environmental approach that prefers stairs to lifts, the new head office is spread over two levels rather than four. 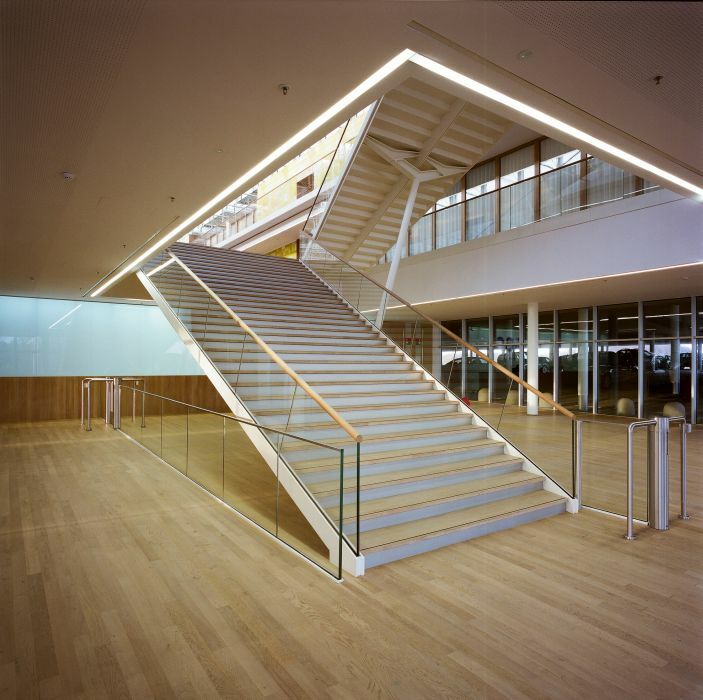 Movement between floors is comfortable and the lifts are rarely used. 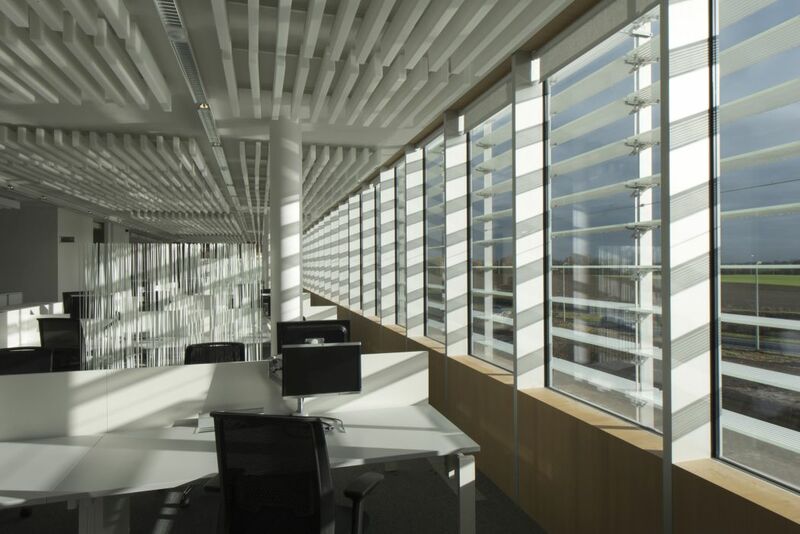 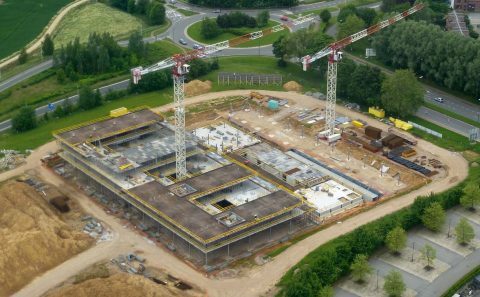 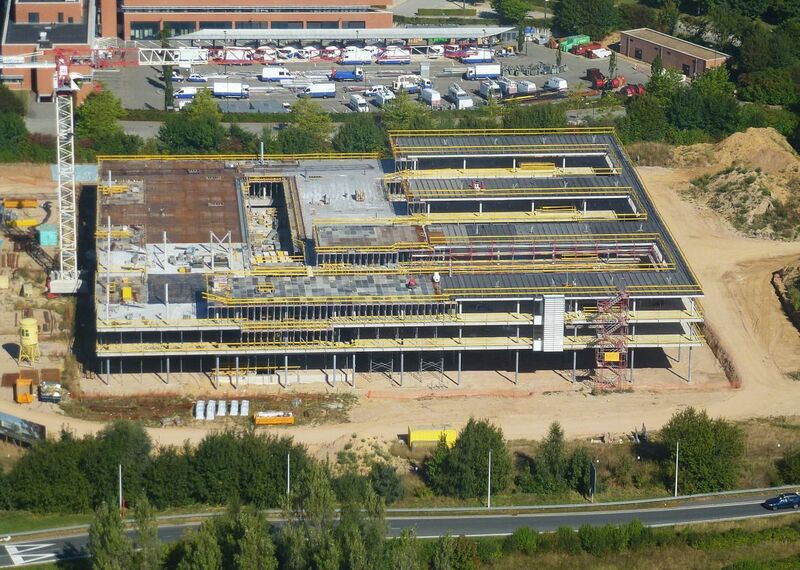 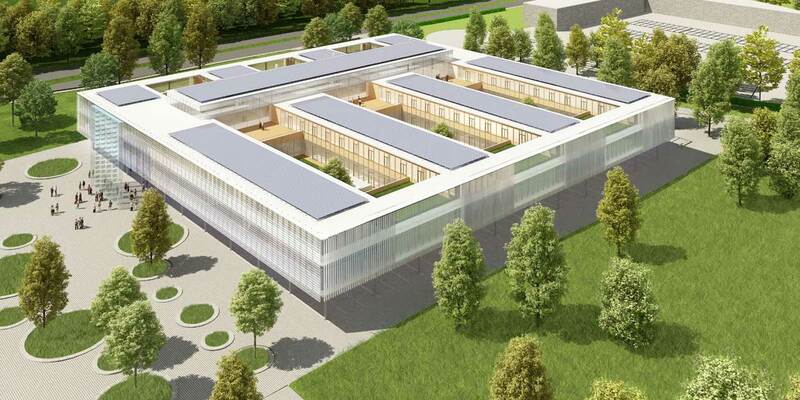 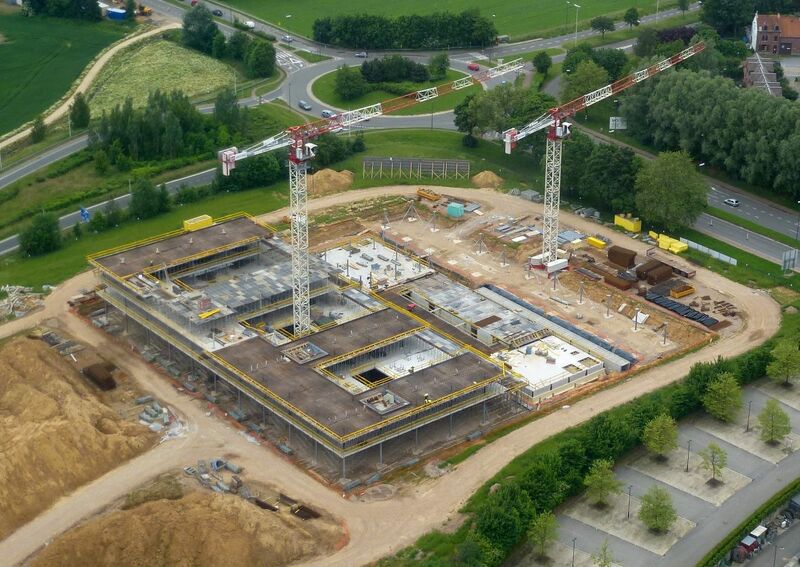 The floor deck covers 10,500 m² for 475 members of staff. 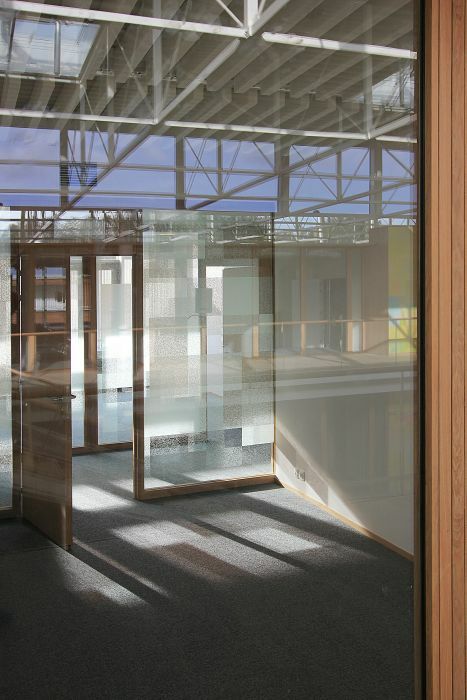 Departmental organisation at AGC Glass is flexible and interior design can keep pace with changes through open-plan areas, closed offices or separate wings if necessary. 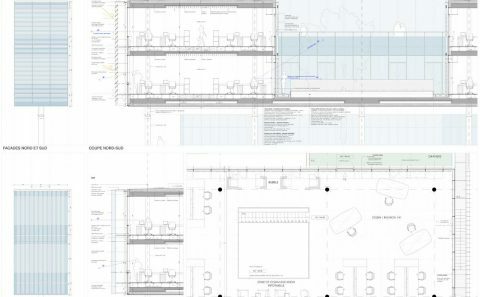 The same flexibility applies to meeting areas and restaurants where the space is divided up as stipulated in the blueprint, by using movable, acoustic partition walls. 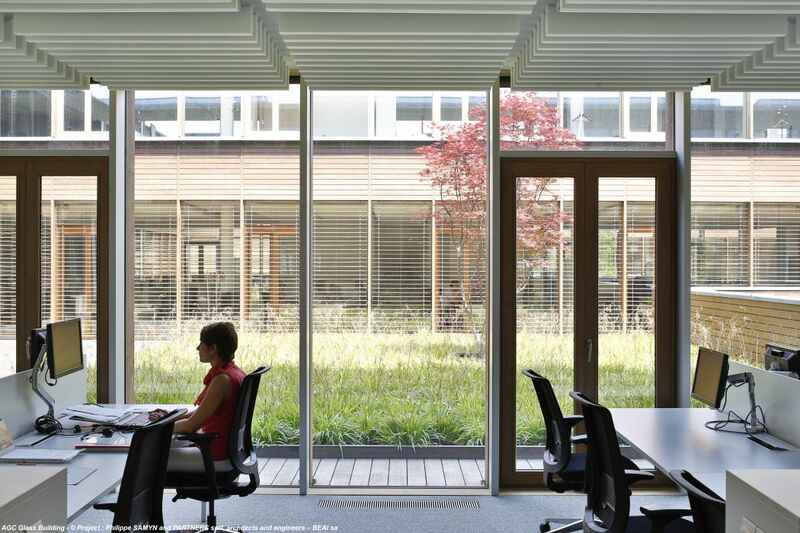 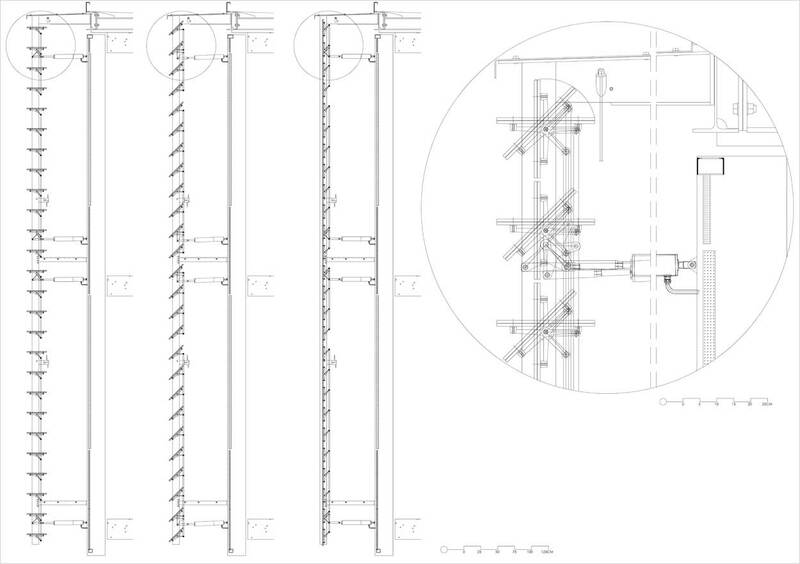 It is possible to extend the new office by elongating each office or meeting wing. 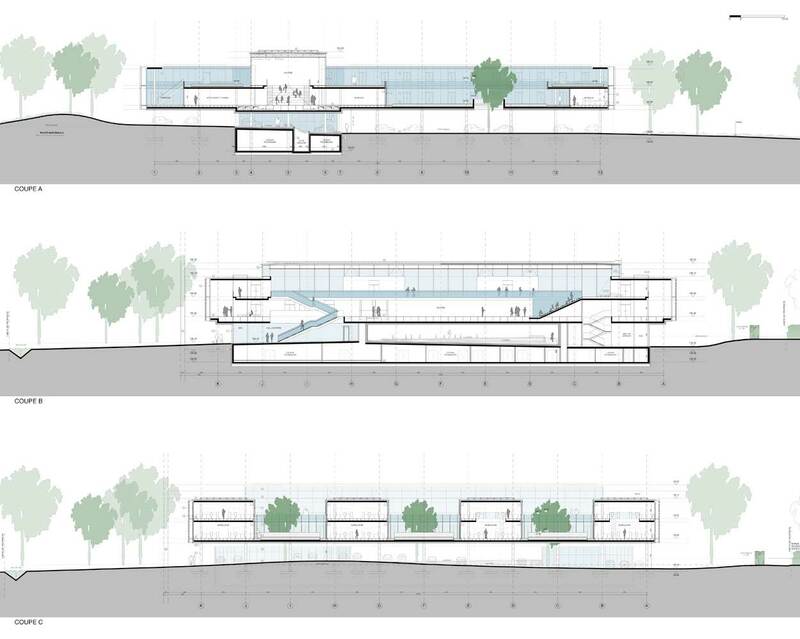 On the other hand, the maximum possible subdivision would be eight autonomous, secure wings of between 575 and 800 m², still linked by and accessible from the gallery. 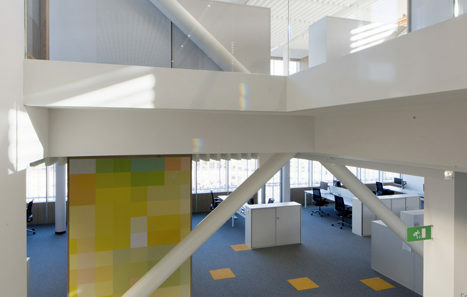 In the interests of user-friendliness in the workplace, the preference is for open-plan areas to be on the south wall. 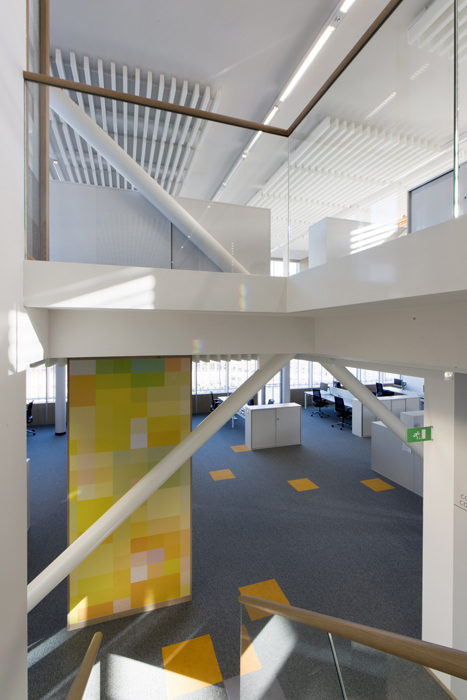 Shared spaces and meeting areas are strategically centralized or situated near a staircase or next to a terrace or patio with a view. 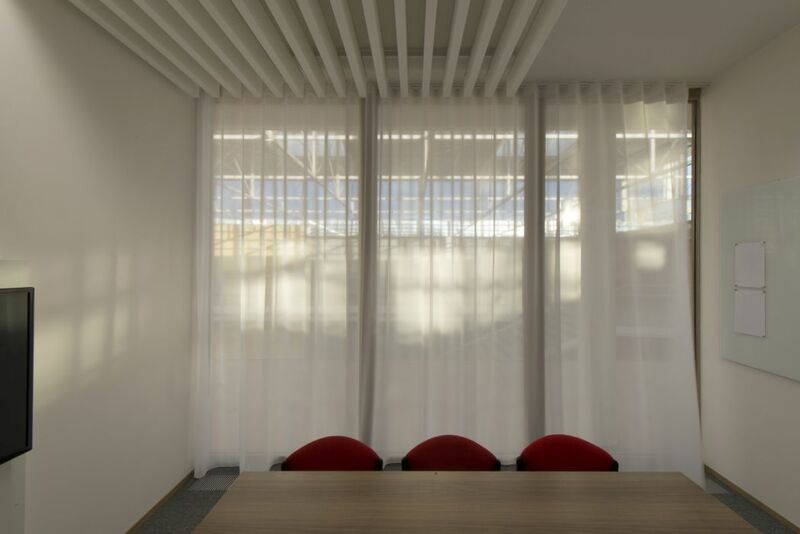 The conference centre brings together all the meeting rooms which are independently managed and so available for use by other parties. 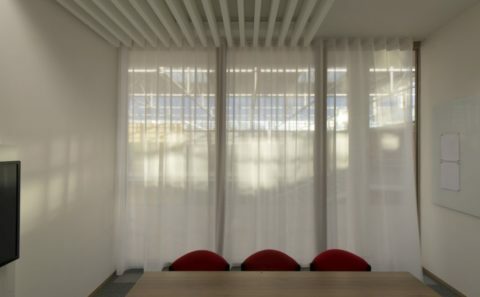 Each room is fitted with audiovisual equipment and enjoys natural light and outdoor views. 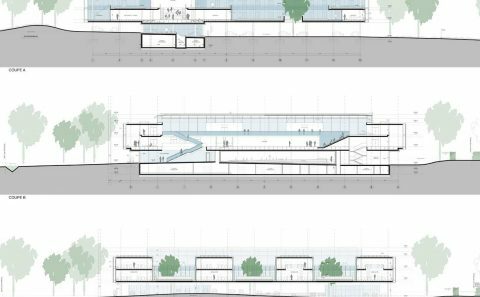 The restaurant area stretches along the western facade and opens up to the outdoors via large terraces. 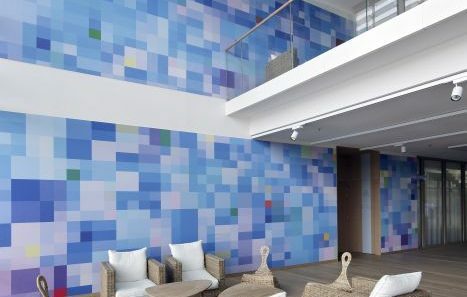 The room can comfortably accommodate 180 people and has a lounge bar. The kitchen, stocked with professional equipment, receives deliveries from a separate service lift and can cater simultaneously to the restaurant, the conference centre and the gallery (cocktail parties, standing buffets etc.). 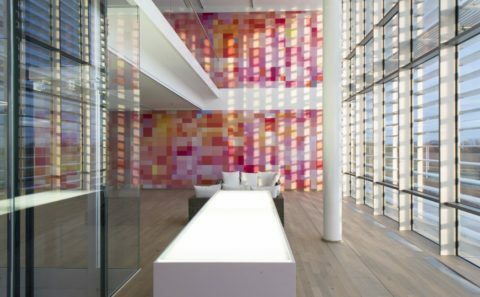 The decor gives each area a unique ambiance and character. 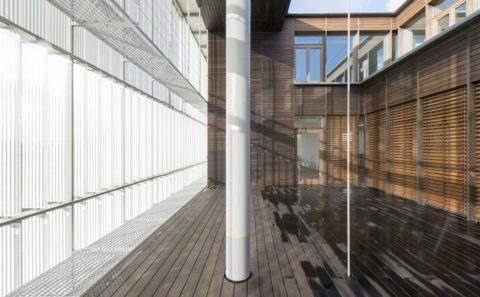 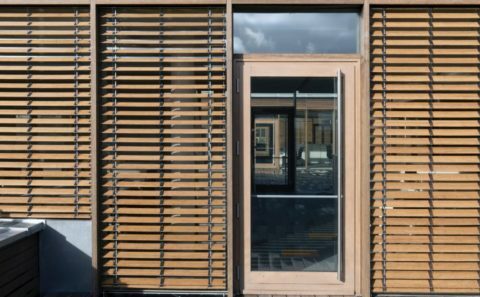 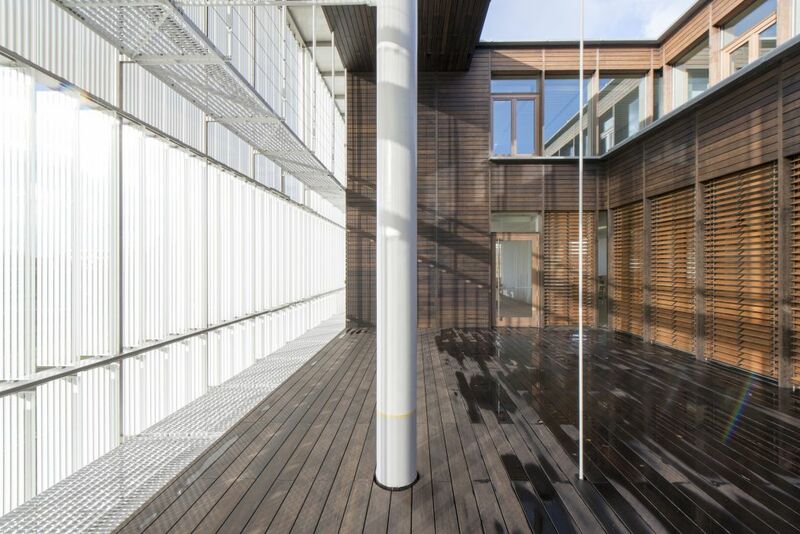 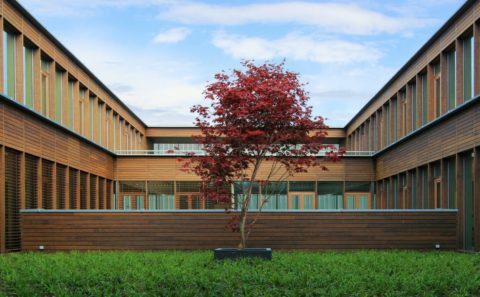 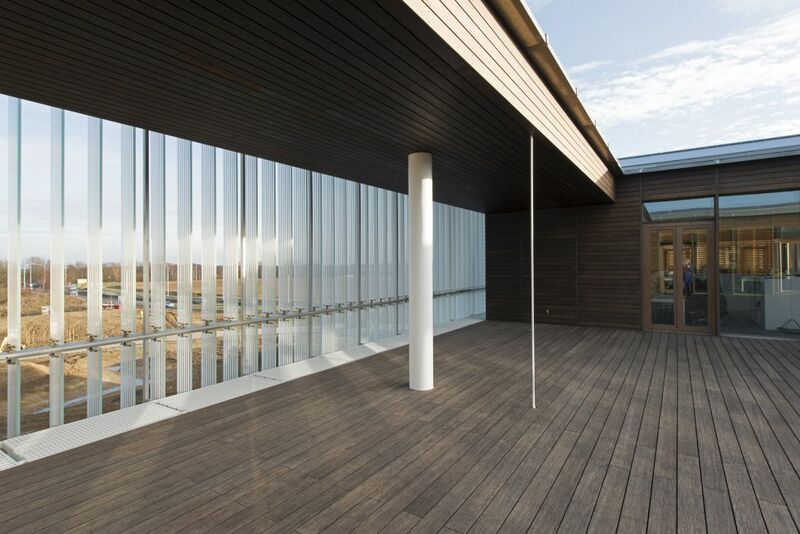 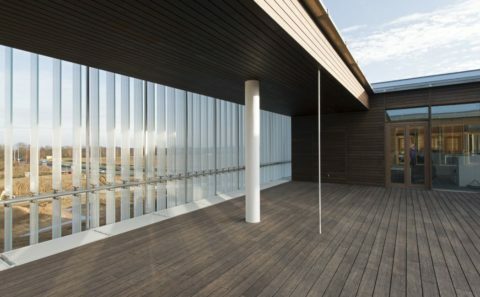 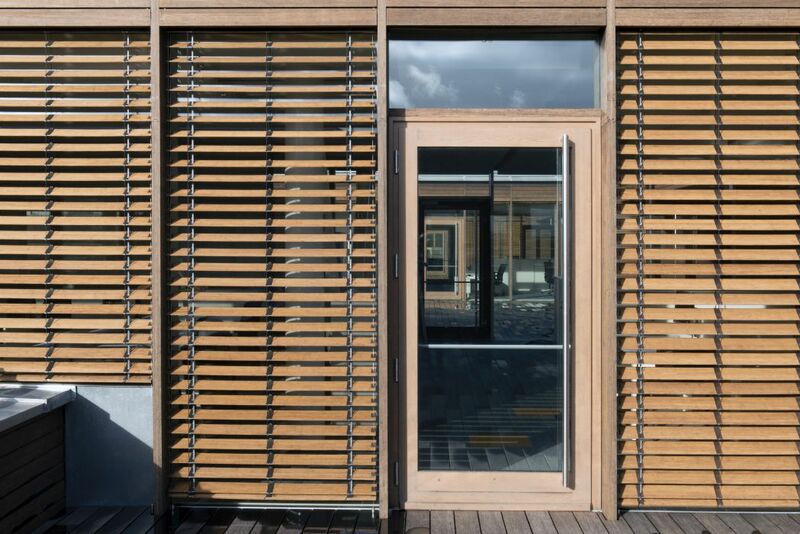 While the materials used on the outer facade are glass and metal, the interior is fitted out mainly in wood (floor, partition walls, furniture etc.). 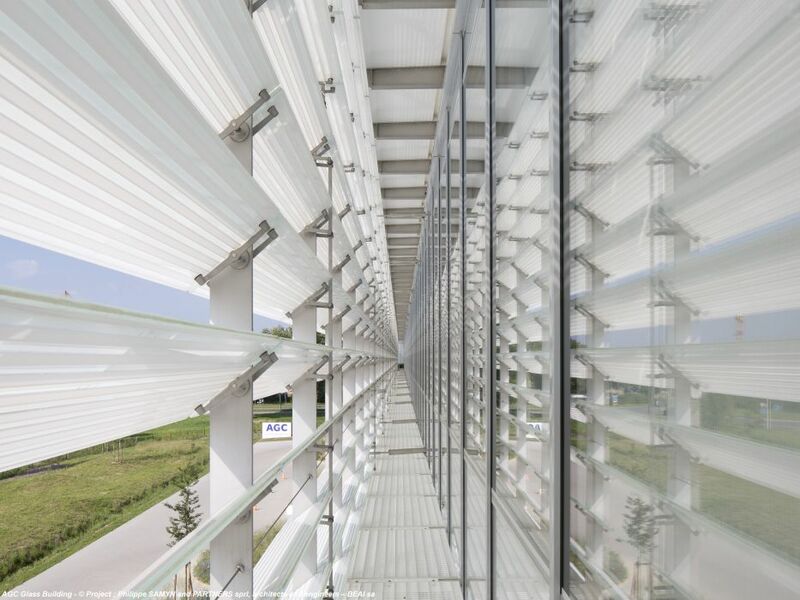 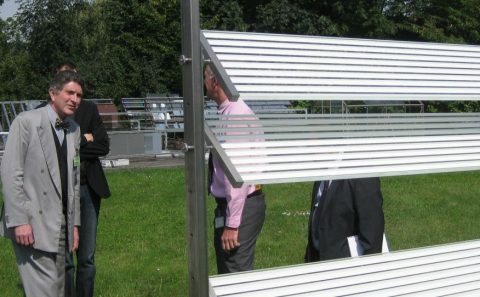 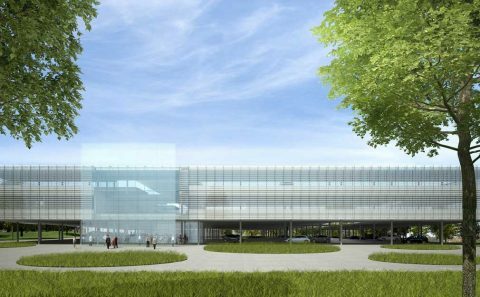 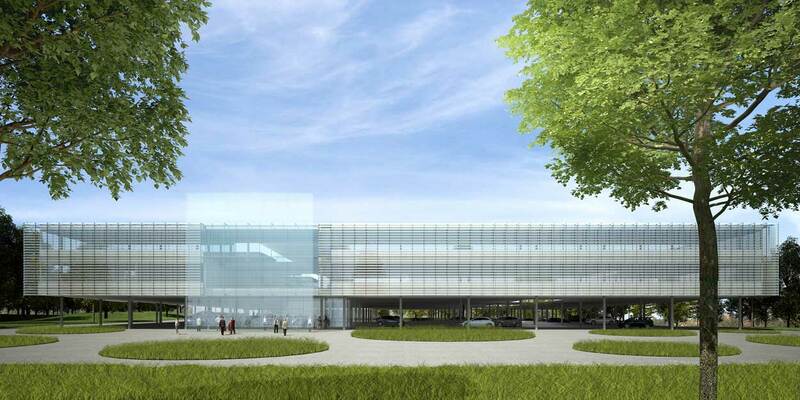 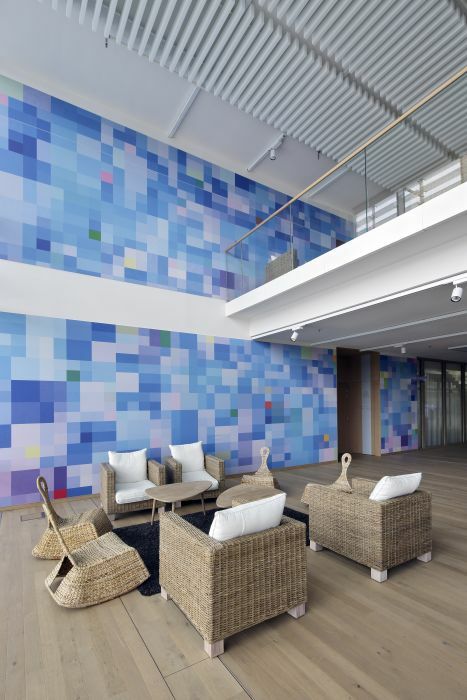 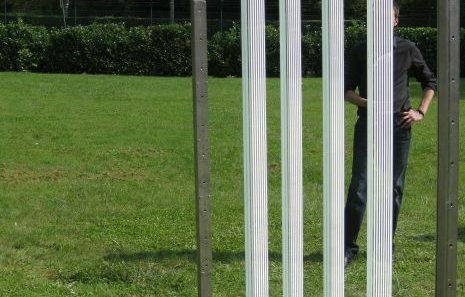 The project demonstrates numerous uses of glass-based products (vision glasses, vacuum glass, enamelled and sandblasted spandrel glass, LED glass, screen-printed glass, photovoltaic panels etc.) 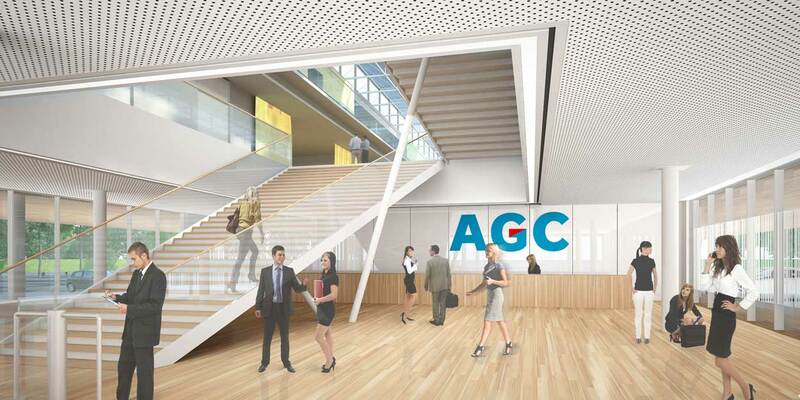 in a bid to showcase the AGC products as well as possible. 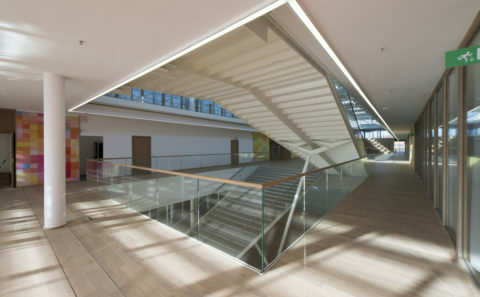 The entrance to the building, in particular, is signposted by a large pixel LED screen installed in the gallery extension. 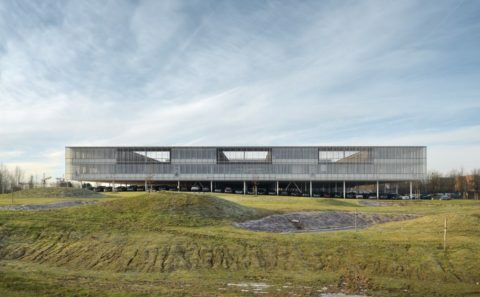 Given the hilly nature of Walloon Brabant, the impact on the landscape is subtle. 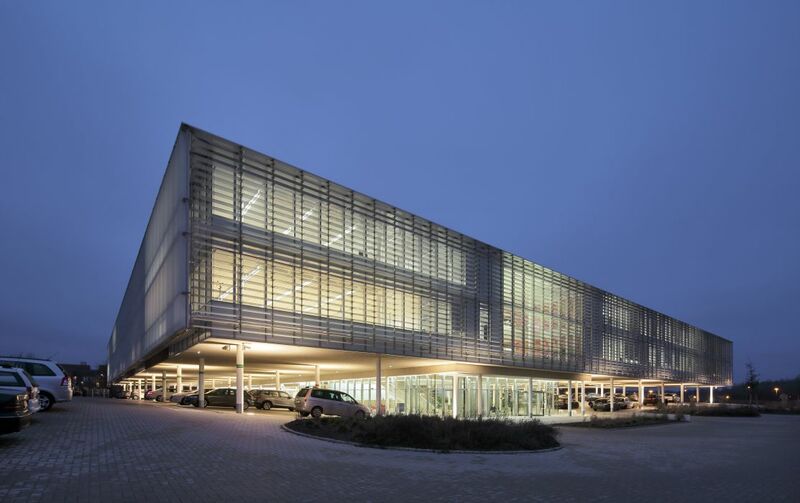 Vehicle access is via a long curved roadway, dug into the landscape. 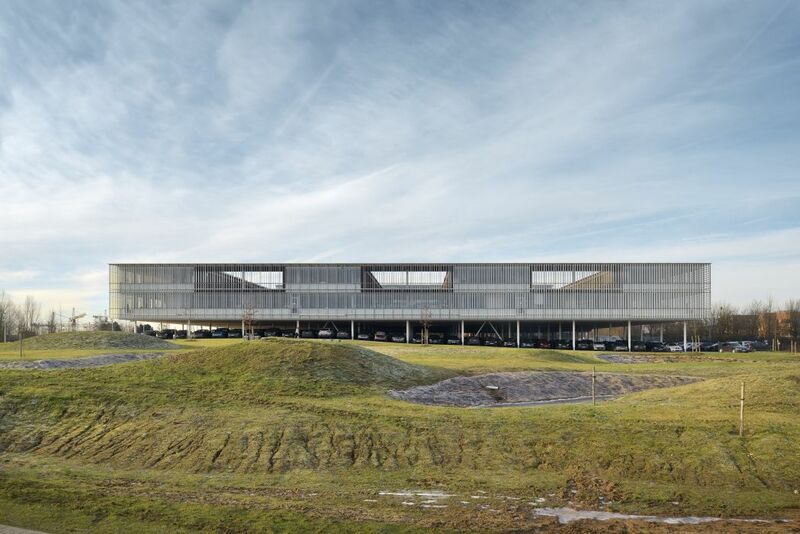 The site is fenced in by hawthorn hedges that are impossible to climb despite their modest height (1.5 m) and do not compromise the view of the AGC office. 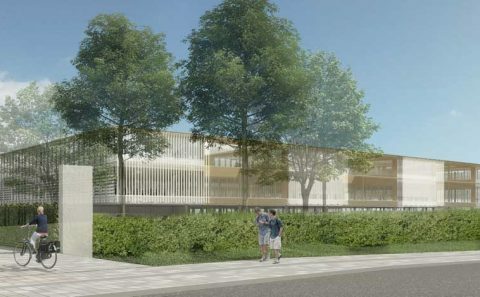 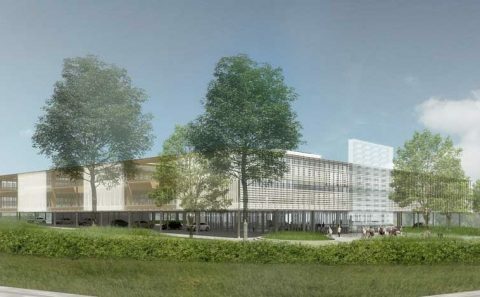 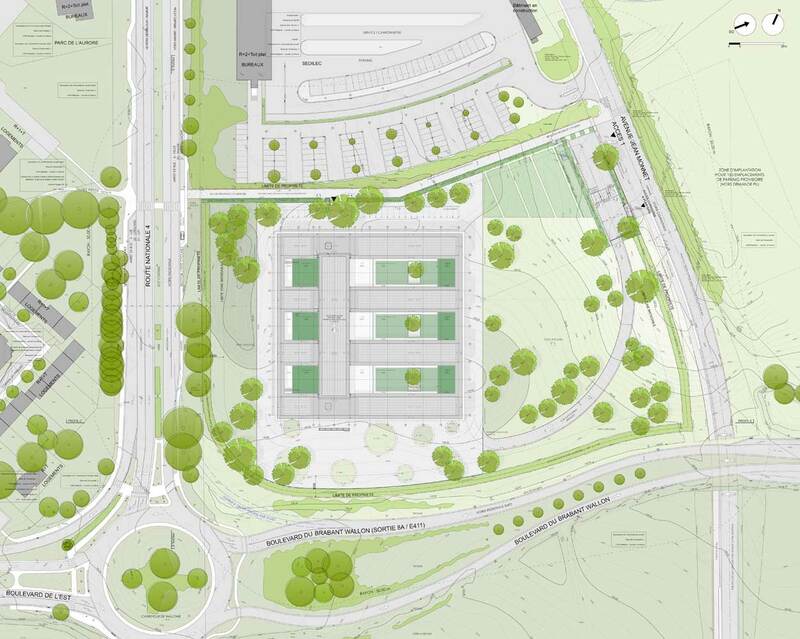 The main entrance is on the Avenue Jean Monnet side of the building and two further entrances are planned for pedestrians and cyclists arriving via public transport and from the town centre. 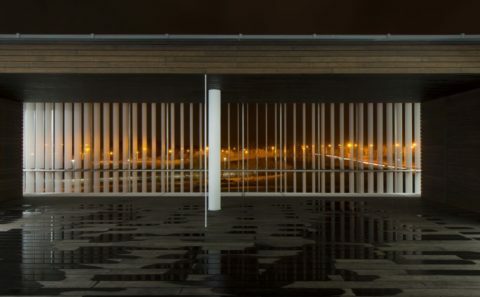 Various types of oak tree (quercus robur, petraea and pubescens) are particularly suited to the environment, which benefits from their reflected glory. Roofs have been converted into extensive green roofs and those on the patios into intensive green roofs, planted with evergreens (luzula sylvatica). 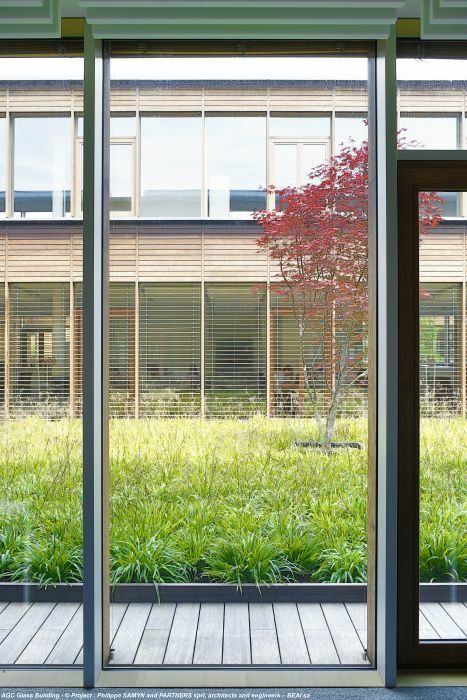 The car park skylights mean it is also possible to plant trees with light foliage (prunus avium or tilia cordata) directly into the soil in the middle of the building. 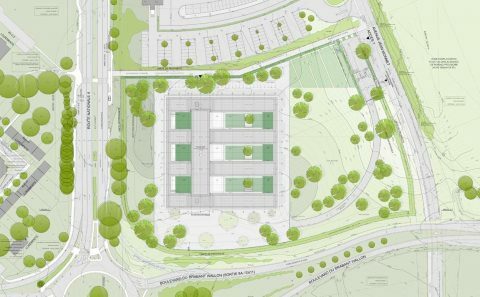 Grey water treatment by stabilization ponds is the subject of an in-depth study to ensure there are benefits in terms of the local ecosystem. 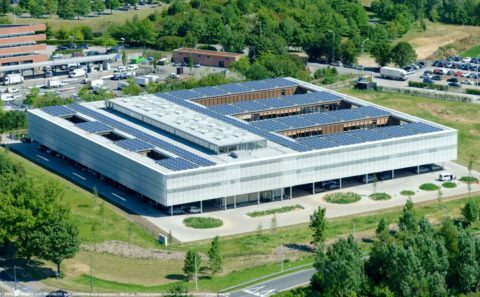 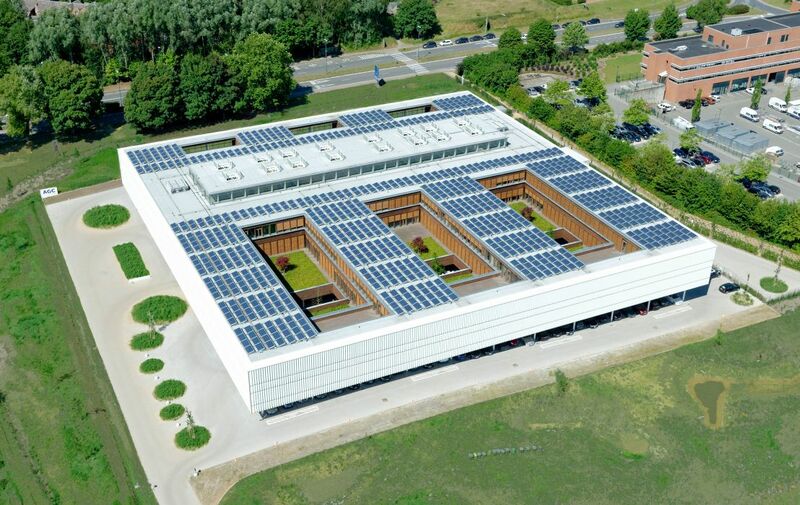 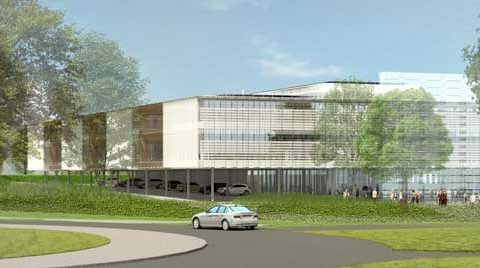 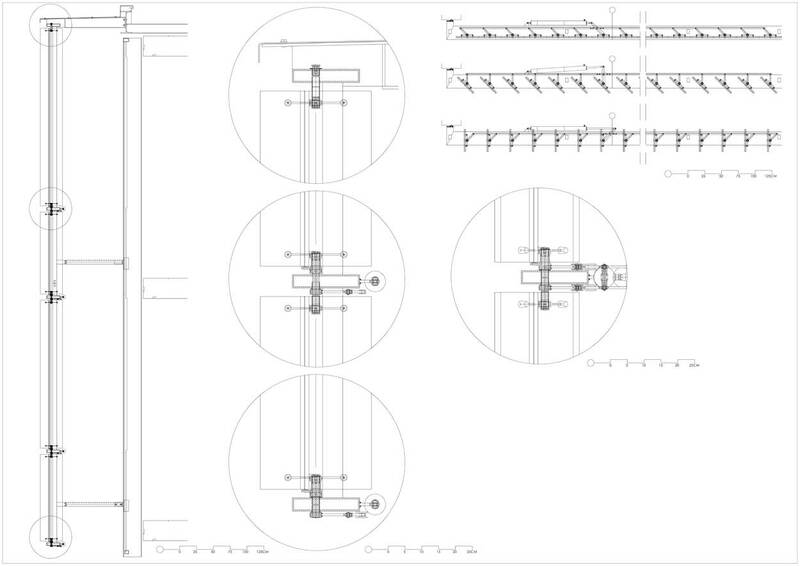 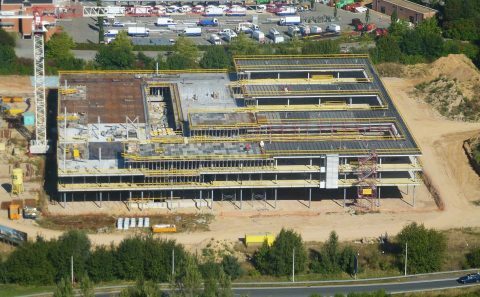 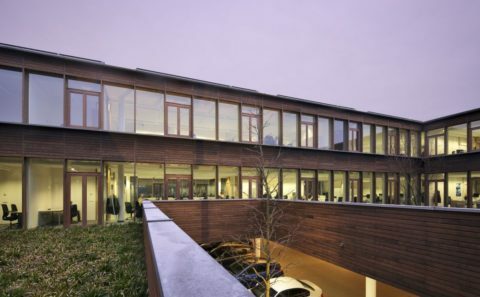 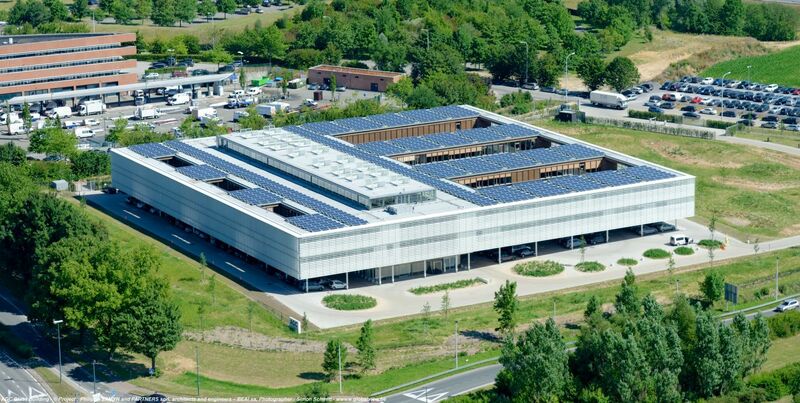 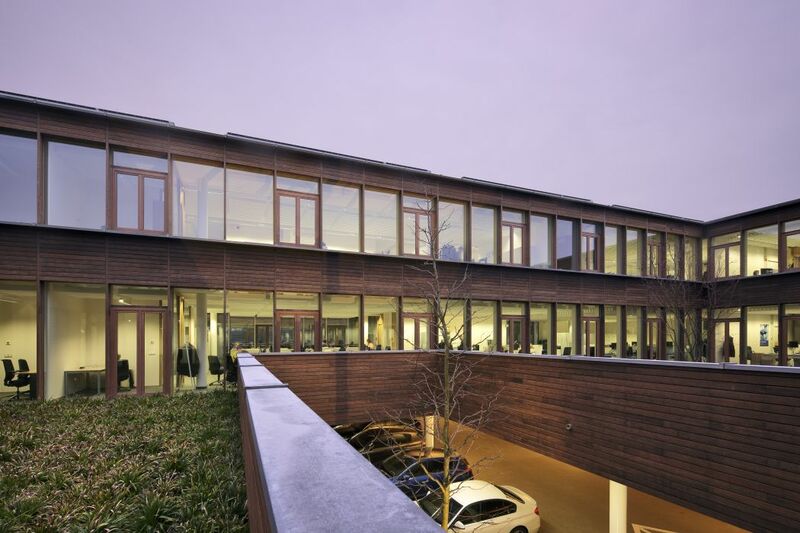 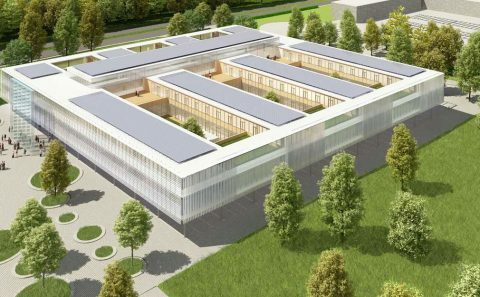 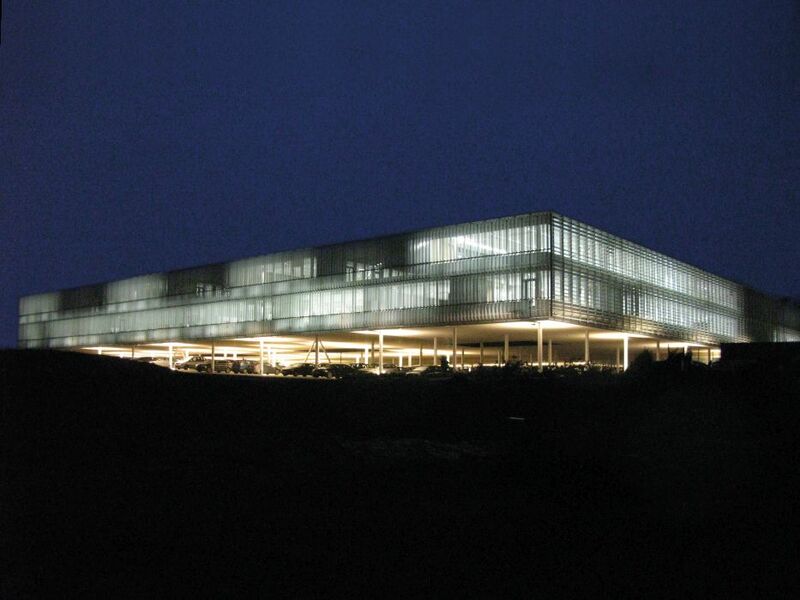 In terms of energy performance, the aim is for the building to achieve zero energy. 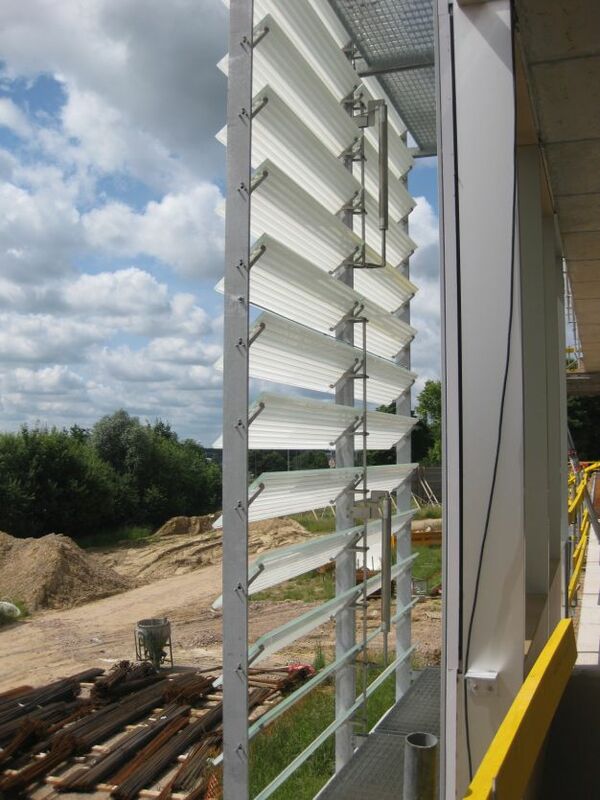 Energy saving, (natural light, insulation etc.) 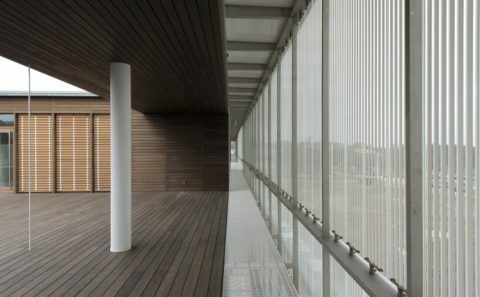 the use of efficient materials (energy-saving circulation, regulation etc.) 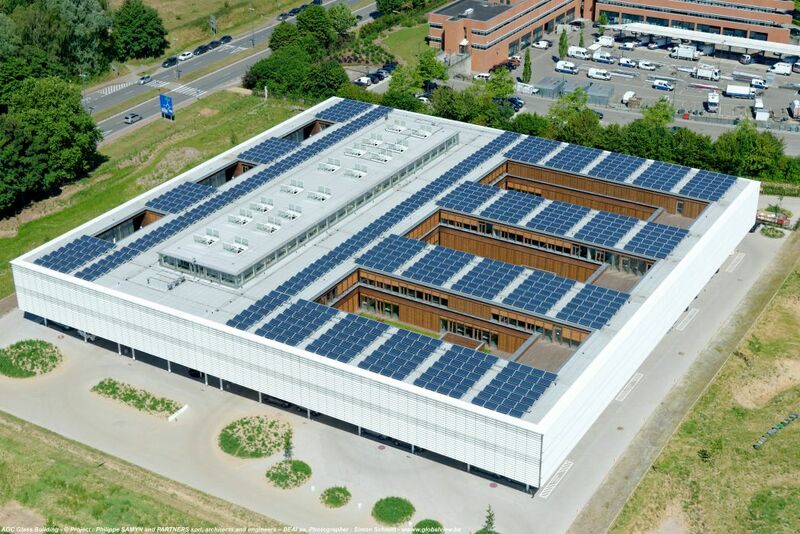 and reliance on renewable energy (photovoltaic panels, ground probes, heat pumps etc.) 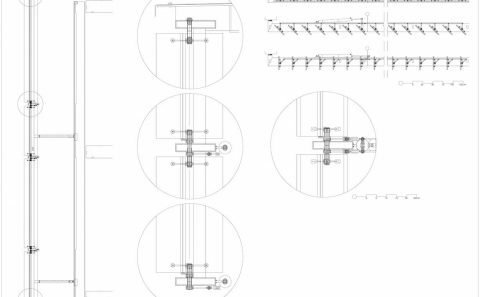 will make it possible to do so. 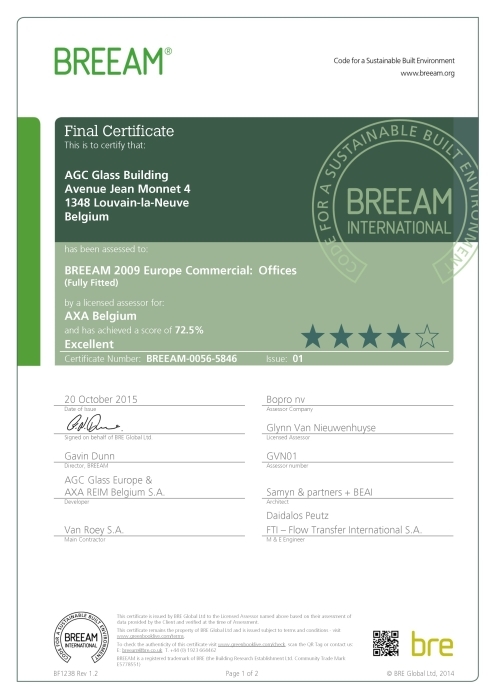 It will be certified by VALIDEO and/or BREEAM. 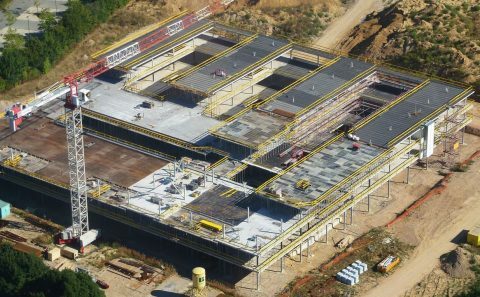 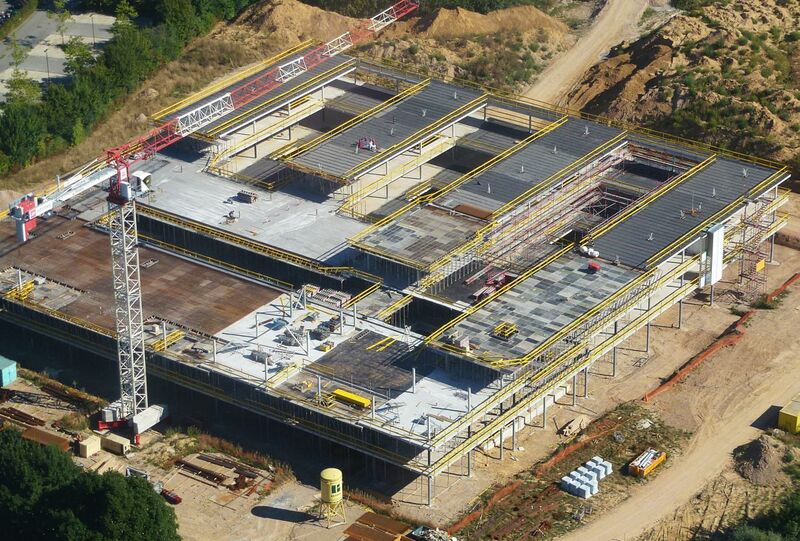 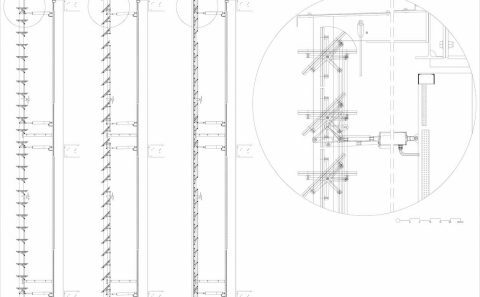 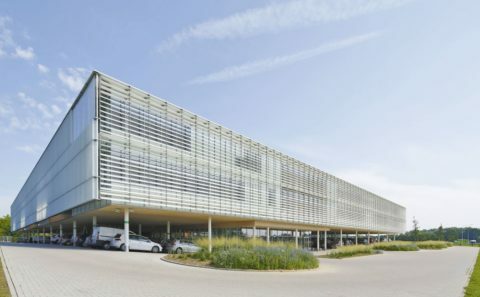 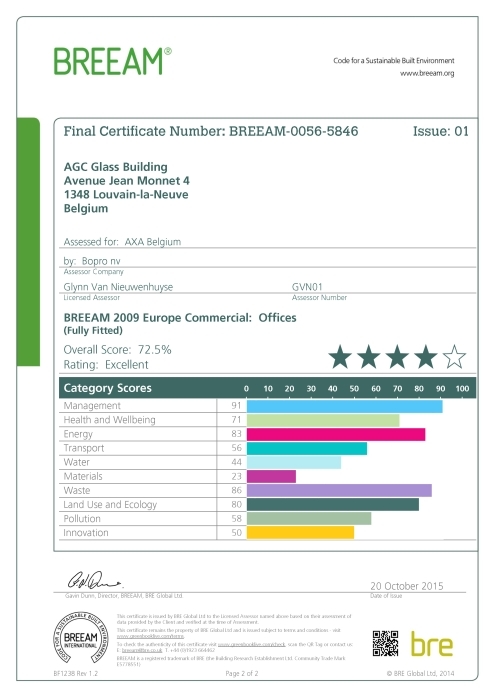 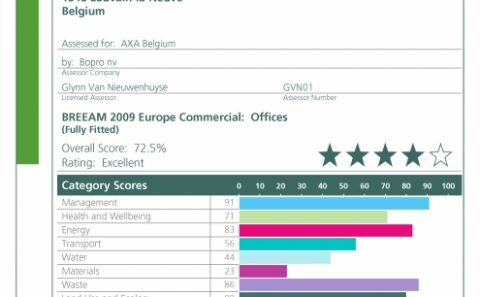 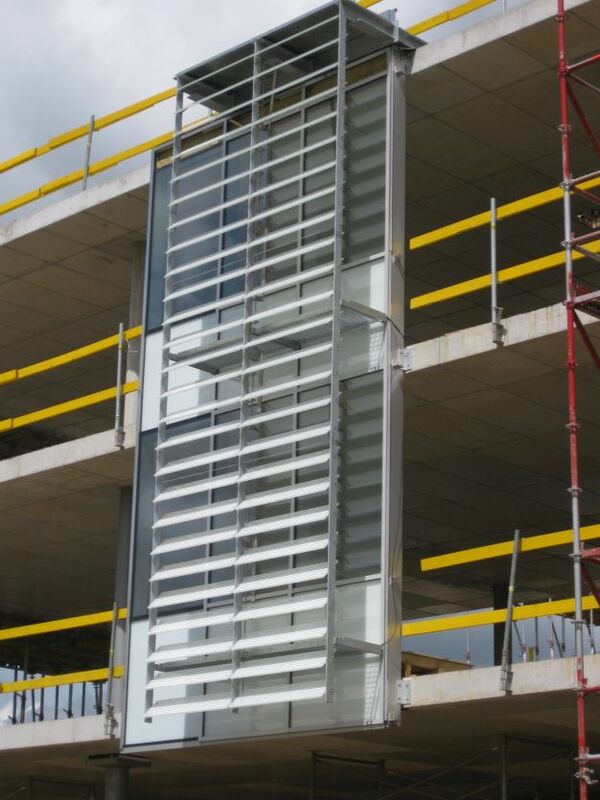 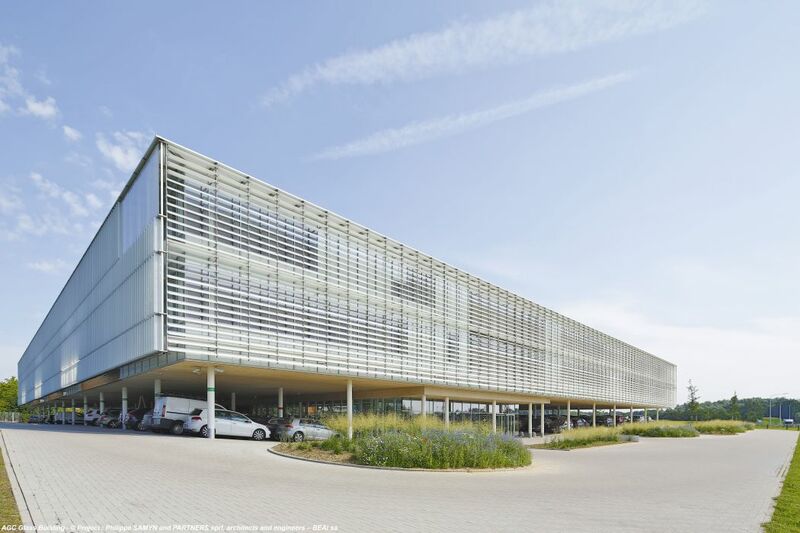 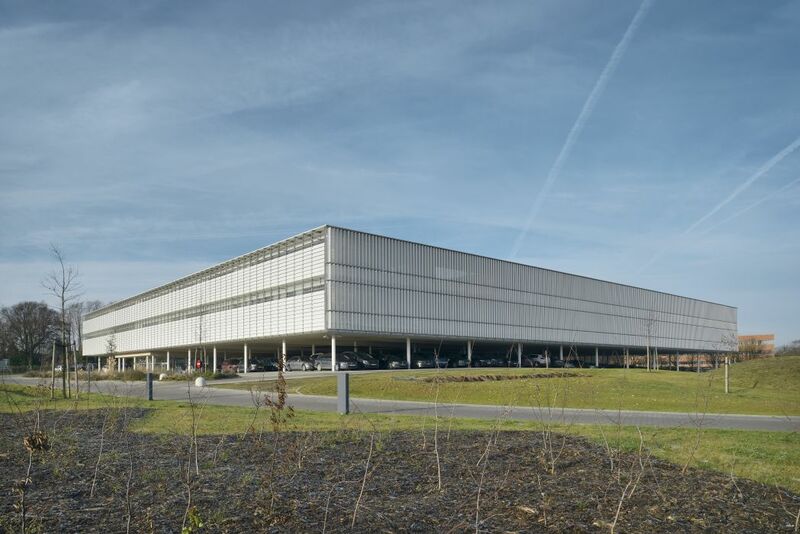 Client: AGC Glass Europe; delegated client: Van Roey Vastgoed n.v. 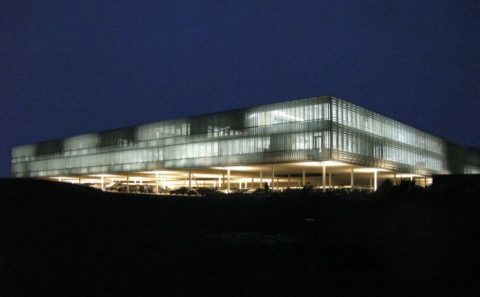 Architecture: Partners in charge : Gh. 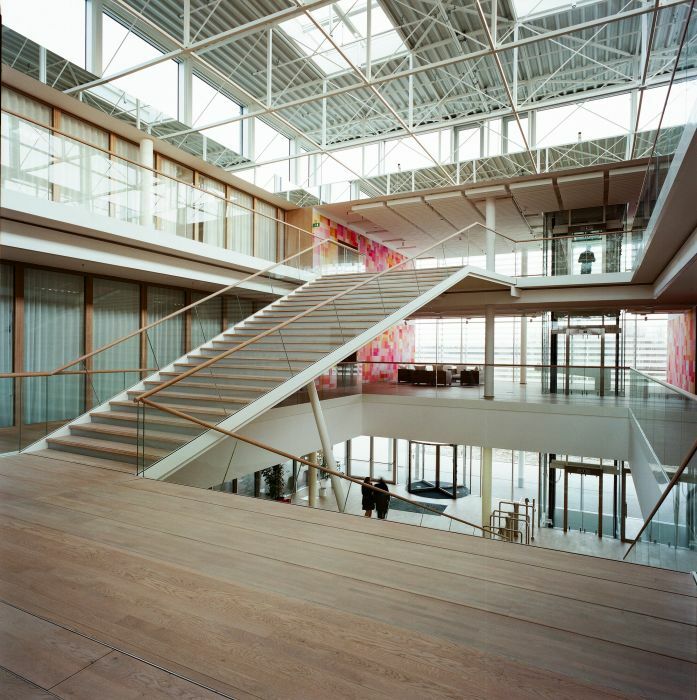 André, J. Ceyssens. 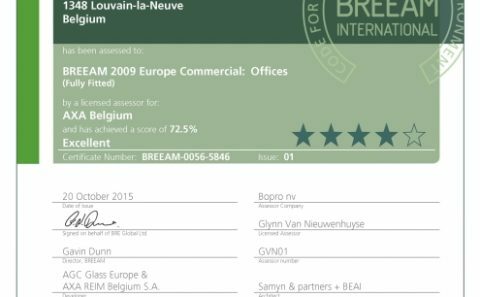 Associates : C. Bazier, S. Buemi, Th. 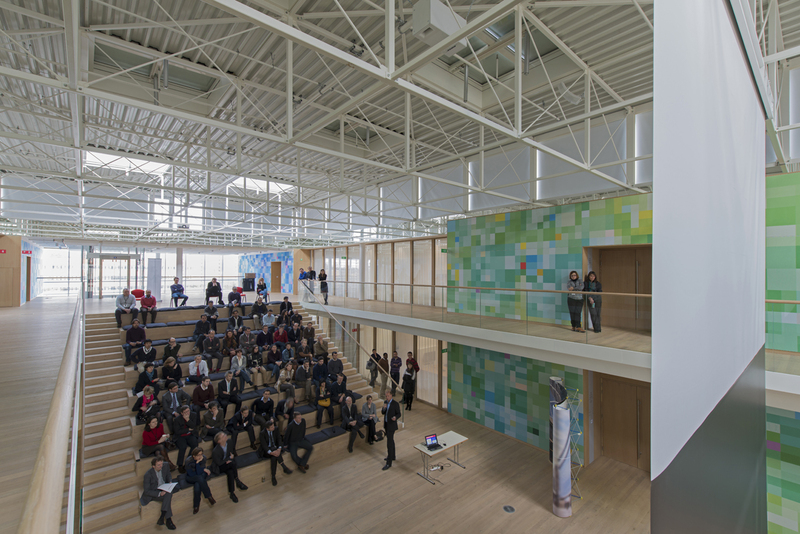 Cooreman, F. Defrenne, S. Dehasque, N. Duvivier, A. Fayt, R. Gijbels, D. Gundes, K. Harnak, O. Jottard, N. L’Abbate, C. Lizin, D. Mélotte, E. Papacosta, F. Tebaldi, S. Tourbach, S. Van Der Meer. 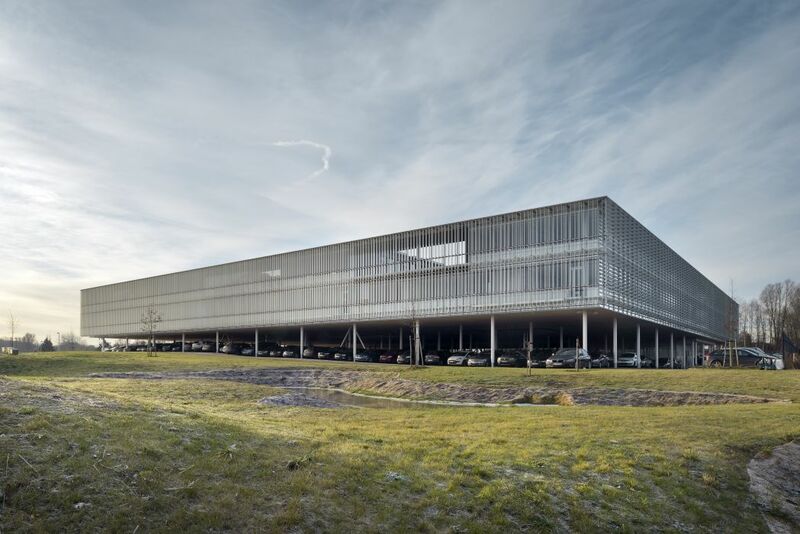 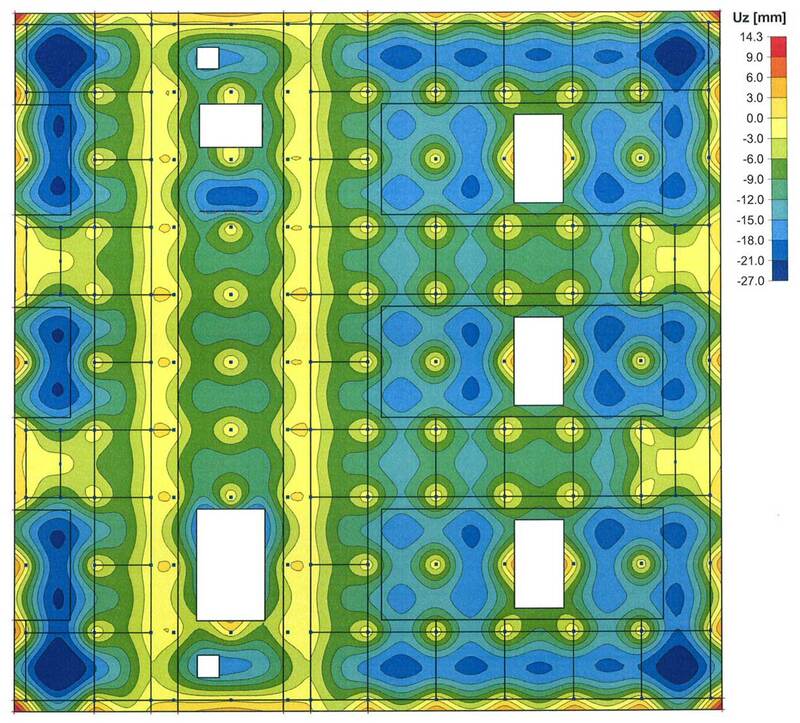 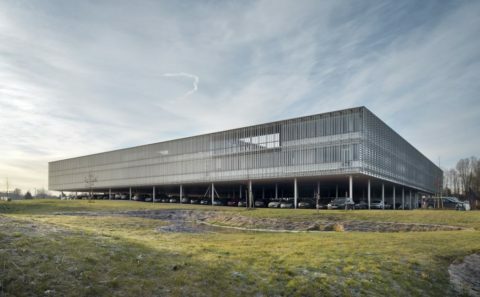 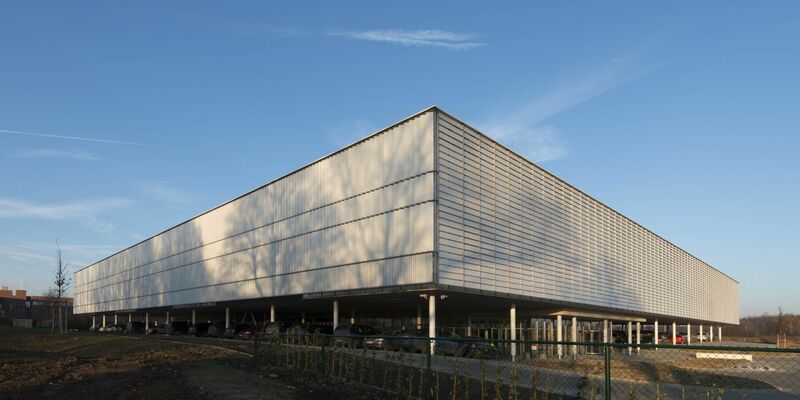 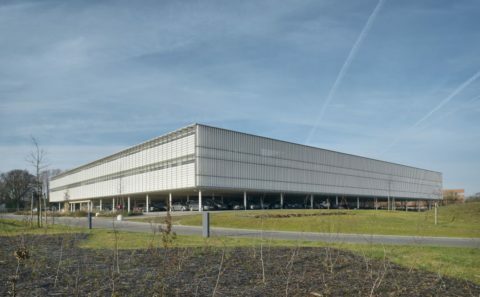 10,923 m² above ground level, 6,383 m² of parking space; 6,475 m² of surrounding area; 2010 – 2014 (01/577).